In multicellular eukaryotes the capacity to express defined subsets of genes at the correct time and place underpins normal development. While genetically encoded regulatory pathways define the nature of these gene expression patterns in individual cell types and tissues, these systems must ultimately converge on a DNA substrate that is not unadorned, but instead wrapped around histone proteins to form nucleosomes and chromatin. Through studying chromatin function in the context of gene regulatory networks it is now clear that modification of DNA and histones is essential for controlling normal regulation of gene expression (Bannister and Kouzarides, 2011). In animals, Polycomb group (PcG) proteins play central roles in gene regulation through their chromatin modifying activities. First identified in Drosophila as important regulators of body plan specification, orthologous PcG systems were subsequently identified in vertebrates and also shown to be essential for developmental gene regulation (Lewis, 1978; Schwartz and Pirrotta, 2013). Biochemical characterization of PcG proteins has revealed that they form large multiprotein complexes that function as chromatin-modifying or -remodelling enzymes (Müller and Verrijzer, 2009; Simon and Kingston, 2013). PcG proteins generally fall into one of two multiprotein complexes, called Polycomb repressive complex 1 and 2 (PRC1 and PRC2). PRC1 functions as a histone E3 ubiquitin ligase that mono-ubiquitylates histone H2A at position 119 (H2AK119ub1) (Cao et al., 2005; de Napoles et al., 2004; Wang et al., 2004a) and PRC2 is a histone H3 lysine 27 (H3K27) methyltransferase (Cao et al., 2002; Czermin et al., 2002; Müller et al., 2002; Margueron and Reinberg, 2011). Together, the activities of these two PcG protein complexes play important roles in maintaining repressive chromatin states and controlling gene expression during cell fate transitions (Xie et al., 2013; Arnold et al., 2013; Boyer et al., 2006; Leeb and Wutz, 2007; Endoh et al., 2008; Terranova et al., 2008; Koche et al., 2008; Bracken et al., 2006). The defined molecular mechanisms that underpin how PcG complexes regulate transcription still remain poorly understood. However, it has been proposed that the occupancy of PRC1 and PRC2 at genomic target sites and their capacity to modify histones may function to create structurally compacted chromatin which is inhibitory to transcription (Eskeland et al., 2010; Francis et al., 2004; Wani et al., 2016; Boettiger et al., 2016). To achieve this, the function of PRC1 and PRC2 appear to be intimately linked. For example, some PRC1 complexes are able to recognise and bind PRC2-dependent H3K27me3, recruiting those PRC1 complexes to sites occupied by PRC2 (Min et al., 2003; Wang et al., 2004b). Similarly, PRC2 can recognize PRC1-deposited H2AK119ub1, regulating PRC2 occupancy on chromatin (Blackledge et al., 2014; Cooper et al., 2014). Furthermore, in vitro assays have suggested that H2AK119ub1 may also stimulate the enzymatic activity of PRC2 (Kalb et al., 2014). Based on these observations it has been proposed that feedback mechanisms, whereby one Polycomb repressive complex supports the recruitment and possibly activity of the other complex, may in part underpin chromatin-based transcriptional repression (Blackledge et al., 2015; Steffen and Ringrose, 2014; Voigt et al., 2013). In other scenarios the relevance of histone modifications to gene repression, particularly the role of H2AK119ub1, has remained unclear, with the repressive nature of PRC1 being proposed to reside within its capacity to alter chromatin structure and compaction independently of its H2A ubiquitylating activity (Pengelly et al., 2015; Illingworth et al., 2015; Francis et al., 2004; Eskeland et al., 2010). However in most cases, the defined contribution of H2AK119ub1-dependent and –independent pathways, and their relevance to Polycomb chromatin domain function in vivo have remained incompletely defined. In order to understand the mechanisms by which the PcG systems function together in vivo, it will be critical to discover how, if at all, their enzymatic activities contribute to chromatin structure and gene regulation. While significant effort has been placed on understanding in vitro how the H3K27 methyltransferase activity of PRC2 is controlled (Margueron et al., 2009; Jiao and Liu, 2015; Cao and Zhang, 2004), far less is known about how PRC1 complexes catalyse H2AK119ub1 and how this relates to the function of PRC1 in vivo. This paucity in our understanding of PRC1 activity is in part due to the diverse nature of individual PRC1 complexes. At the simplest level, PRC1 complexes are formed by their catalytic subunit, RING1A or RING1B, which dimerises with a PCGF protein to form an active E3 ubiquitin ligase that targets histone H2A (Levine et al., 2002; Satijn et al., 1997). In mammals, there are six PCGF proteins (PCGF1–6), and the identity of the PCGF protein incorporated into PRC1 appears to direct interaction with a specific complement of auxiliary proteins, giving rise to an array of diverse PRC1 complexes (Blackledge et al., 2014; Gao et al., 2012; Tavares et al., 2012). Based on the protein subunit composition of these individual PRC1 complexes, they are often then divided into ‘canonical’ or ‘variant’ complexes. Canonical PRC1 complexes form around either PCGF2 or 4, and incorporate a chromobox (CBX) protein, which can directly bind to PRC2-catalysed H3K27me3 (Fischle et al., 2003; Bernstein et al., 2006; Min et al., 2003). In contrast, variant PRC1 complexes can form around all six PCGF proteins, but these complexes engage with RYBP or YAF2, two proteins that bind to a site on RING1B that is mutually exclusive with CBX protein binding (García et al., 1999; Wang et al., 2010). Despite the diversity of PRC1 complexes, biochemical characterization of their catalytic activity has largely been focused on canonical PCGF2/PCGF4-containing complexes (Li et al., 2006; Gao et al., 2012; Elderkin et al., 2007; Cao et al., 2005; Buchwald et al., 2006; Ben-saadon et al., 2006). For example, in vitro ubiquitylation assays using reconstituted complexes and nucleosome substrates demonstrated that RING1(A/B) could form an active E3 ligase in the presence of either PCGF2 or PCGF4 (Elderkin et al., 2007; Buchwald et al., 2006). Furthermore, a minimal complex comprised of a dimer between the N-terminal RING finger domains of PCGF4 and RING1B was sufficient to deposit H2AK119ub1 (Buchwald et al., 2006). Importantly, the RING finger domains of individual PCGF proteins are highly similar, suggesting that they will likely all support formation of an active E3 ligase complex. However, more recent work examining PCGF(1–6)/RING1(A/B) catalytic RING-RING dimers revealed that PCGF(2/4)/RING1(A/B) were less active than PCGF(1/3/5/6)/RING1(A/B) in autoubiquitylation and E2 lysine discharge assays (Taherbhoy et al., 2015). Surprisingly, when these same assemblies were challenged with physiologically relevant nucleosome substrates, complex-specific activities were no longer apparent. Nevertheless, consistent with the possibility that individual PRC1 complexes may have distinct activities related to protein complex composition, in vivo studies in both mammals and Drosophila have suggested that less-well characterized variant PRC1 complexes may contribute more significantly to H2A mono-ubiquitylation than canonical PRC1 (Tavares et al., 2012; Lee et al., 2015; Lagarou et al., 2008; Blackledge et al., 2014). For example, the Drosophila dRAF complex, which appears to have similarities to mammalian variant PRC1 complexes, is a highly active H2A ubiquitin ligase in vitro and appears to be the predominant H2A ubiquitin ligase in Drosophila S2 cells (Lagarou et al., 2008). Furthermore, a PCGF3 orthologue contributes widely to H2AK119ub1 in cultured Drosophila cells (Lee et al., 2015). This raises the possibility that individual PCGF proteins might confer differing E3 ligase activities on PRC1, either directly, or via interaction with complex-specific regulatory subunits. Indeed, incorporation of the auxiliary subunits RYBP, PHC2 or CBX2/8 into a PCGF4/RING1B complex has been reported to affect its E3 ligase activity in different ways (Gao et al., 2012), though this was not the case for PCGF2/RING1B, in which auxiliary subunits had little impact on catalytic activity (Tavares et al., 2012). 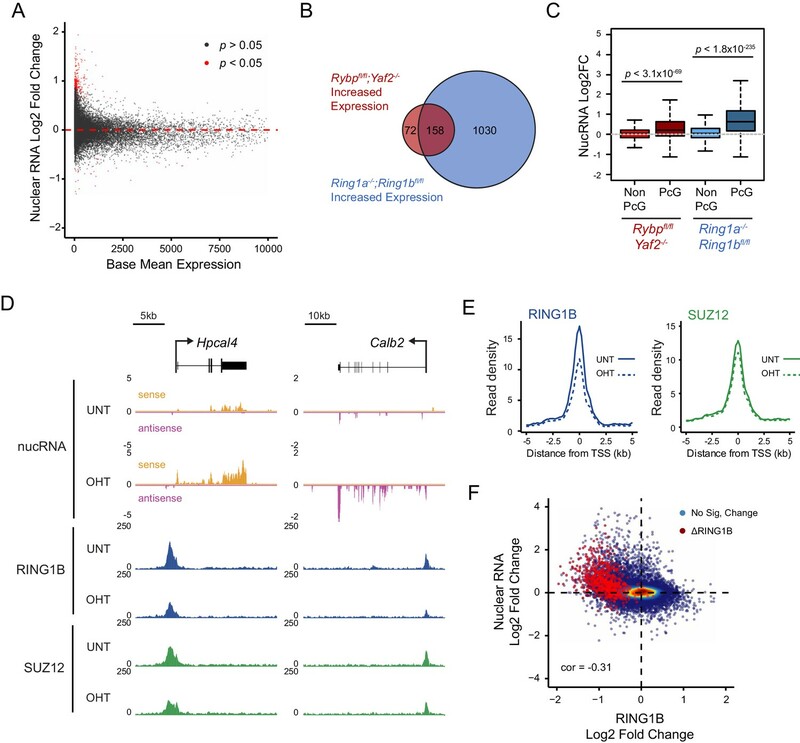 Therefore a more detailed understanding of how H2AK119 ubiquitin ligase activity is shaped by different PRC1 assemblies, both in vitro and in vivo, is required to better understand PRC1 involvement in polycomb chromatin domain function and gene regulation. To address these important questions we have exploited biochemical and genomic approaches to interrogate PRC1 enzymatic activity in vitro and in cells. This revealed that PRC1 complexes are highly modular, and that the enzymatic activity of PRC1 is defined by the choice of PCGF protein combined with the influence of RYBP/YAF2, uncovering an enzymatic logic within the assembly of individual PRC1 complexes. Building on these discoveries, genetic ablation and genomic approaches uncover a widespread role for RYBP in stimulating H2AK119 E3 ligase activity in vivo, and we demonstrate that the absence of this activity leads to defects in the deposition of H3K27me3 by PRC2. Importantly, in the absence of RYBP, loss of PRC1 stimulation and subsequent defects in PRC2 activity can lead to erosion of Polycomb chromatin domains and susceptibility to inappropriate gene activation signals. Together, these observations identify an activity-based communication between PRC1 and PRC2 in vivo, and suggest that histone modification-dependent thresholding mechanisms sustain Polycomb chromatin domains, connecting the activity of PcG systems to their occupancy on chromatin and transcriptional repression. In embryonic cells and tissues where the PcG system is thought to play a pivotal role in developmental gene regulation, the PCGF1-PRC1 complex is highly abundant (Kloet et al., 2016), and is required for H2AK119ub1 and normal development (Farcas et al., 2012; Blackledge et al., 2014; Gao et al., 2012; He et al., 2013; Wu et al., 2013; Gearhart et al., 2006; Boulard et al., 2015). Furthermore, tethering experiments had previously suggested that the variant PCGF1 complex might be more active than PCGF2/4 complexes in vivo (Blackledge et al., 2014). Given the essential nature of this PRC1 complex and its apparent elevated activity in vivo, we sought to use it as a model system to understand the biochemical mechanisms that underpin the assembly and catalytic activity of PRC1. To achieve this, we used a baculovirus co-expression system (Bieniossek et al., 2012) to assemble and affinity-purify the five component PCGF1-PRC1 holocomplex containing RING1B, PCGF1, RYBP, KDM2B and BCOR (Figure 1A and B). To understand in more detail the topology of the PCGF1-PRC1 complex we subjected it to crosslinking followed by tandem mass spectrometry analysis, which identifies the relative proximity of proteins within large protein complex assemblies (Leitner et al., 2014). This revealed clear spatial relationships between individual components of the complex (Figure 1C). For example, RING1B was in close proximity to PCGF1 and RYBP. Importantly RING1B and RYBP crosslinks were consistent with atomic resolution information detailing their physical interaction (Figure 1—figure supplement 1) (Wang et al., 2010). 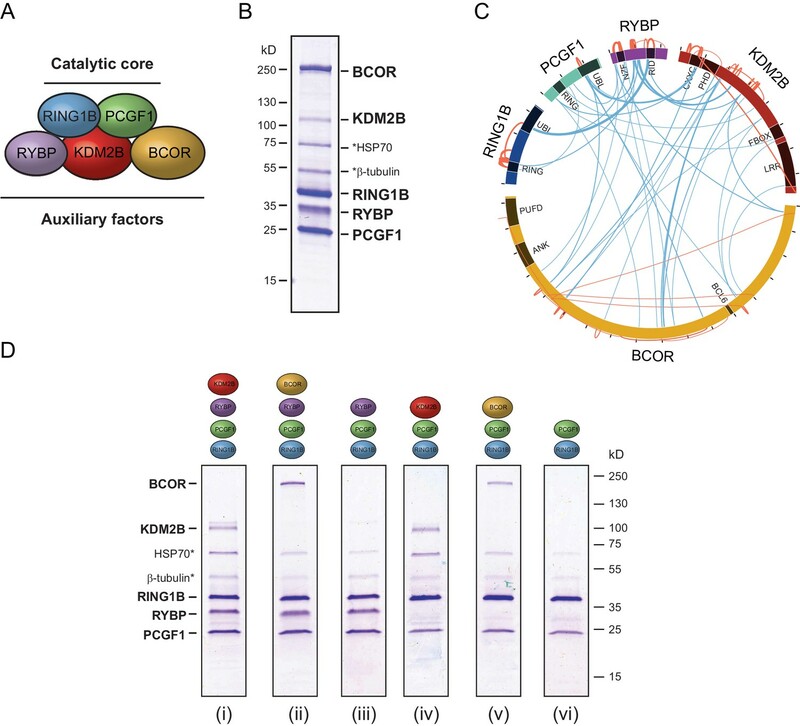 BCOR and KDM2B crosslinked extensively with each other suggesting they are in close proximity and also displayed additional crosslinks with PCGF1 and RYBP. However, there was no evidence for significant crosslinks between either BCOR or KDM2B and RING1B, suggesting they are not in close proximity within the complex. This suggests a high degree of modularity within the PCGF1-PRC1 complex, where individual combinations of proteins engage extensively with each other, while others exhibit little or no clear proximity. PCGF1-PRC1 is a highly modular complex. (A) A schematic of the PCGF1-PRC1 complex indicating the core catalytic dimer of RING1B and PCGF1 and auxiliary components RYBP, KDM2B, and BCOR. (B) A Coomassie-stained gel of PCGF1-PRC1 affinity-purified via RING1B. Individual subunits are labelled and * denotes contaminants HSP70 and β-tubulin. (C) A Circos plot illustrating crosslinking mass spectrometry analysis of the PCGF1-PRC1 complex reveals extensive interactions between PCGF1-PRC1 subunits. Blue and orange lines indicate intermolecular and intramolecular crosslinks respectively. Lines are weighted by the statistical confidence of their interaction. (D) Coomassie-stained gels of affinity-purified PCGF1-PRC1 sub-complexes demonstrating the modularity of PCGF1-PRC1 complex. Complexes were affinity-purified via RING1B. Above each lane (i-vi) the co-expressed factors are illustrated and * denotes contaminants HSP70 and β-tubulin. Based on the apparent modularity of PCGF1-PRC1, we set out to dissect the requirement for individual components in its assembly. To achieve this we generated a series of co-expression vectors in which individual proteins were iteratively omitted (Figure 1D). This revealed that KDM2B and BCOR, which appear to interact with the complex through PCGF1 (Figure 1C), can be completely removed, either individually or in combination, to leave an intact PCGF1-RING1B-RYBP sub-complex (Figure 1D(i–iii)). Similarly, when RYBP was removed from the PCGF1-PRC1 complex, BCOR and KDM2B were still able to independently interact with the PCGF1-RING1B dimer (Figure 1D(iv–v)). This indicates that inclusion of BCOR and KDM2B in the PCGF1-PRC1 complex does not require RYBP, or an interaction with each other. Finally, in agreement with analysis of other PCGF/RING1 interactions, PCGF1/RING1B formed dimers in the absence of other PCGF1-PRC1 components (Figure 1D(vi)). Therefore, the PCGF1-PRC1 holocomplex assembles around a core PCGF1-RING1B dimer, and does so in a highly modular fashion. Interestingly, in Drosophila, the related dRAF complex exhibits similar modularity (Lagarou et al., 2008). This contrasts the assembly of the PRC2 holocomplex, which appears to rely on extensive and highly integrated protein-protein interactions for its efficient formation (Ciferri et al., 2012; Jiao and Liu, 2015). Within multiprotein enzyme complexes, non-catalytic components can function to regulate enzymatic activity, substrate recognition, or targeting. Our understanding of how PRC1 complexes function in these regards remains very poorly defined. 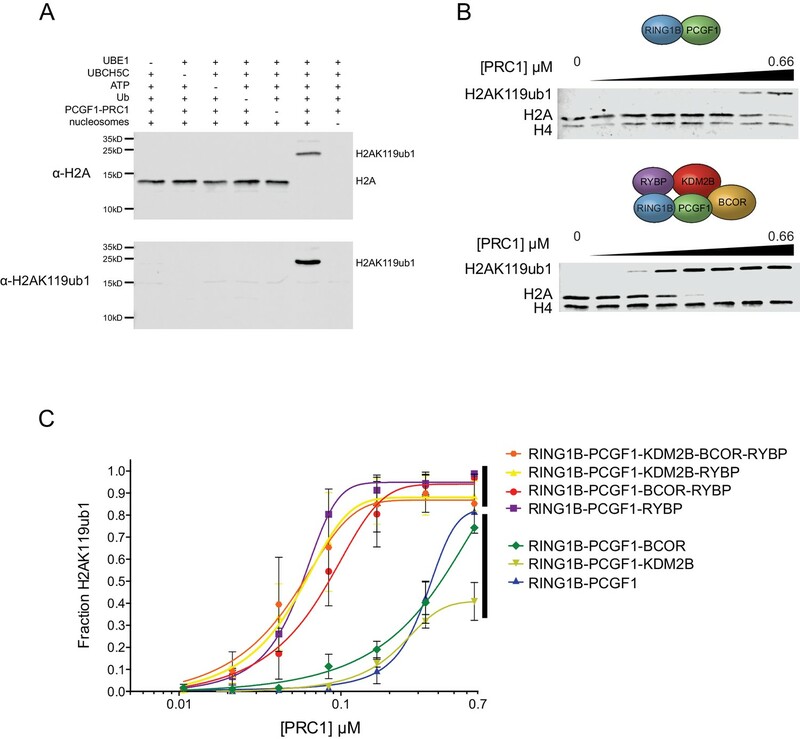 However, the inherent modularity of the PCGF1-PRC1 complex provided a unique opportunity to examine if individual components of the complex contribute to the H2AK119 E3 ligase activity of PRC1. To address this important question, we first established a quantitative in vitro E3 ligase activity assay using nucleosome substrates and confirmed that reconstituted PCGF1-PRC1 was active by detecting the conversion of H2A to mono-ubiquitylated H2A (Figure 2A). We then compared the relative E3 ligase activity of the PCGF1-RING1B core dimer to the five component PCGF1-PRC1 holocomplex (Figure 2B). Surprisingly, the PCGF1-PRC1 holocomplex was substantially more active than the PCGF1-RING1B core (Figure 2B). To understand the molecular determinants controlling this activity, we then iteratively measured the H2AK119 E3 ligase activities of individual PCGF1-PRC1 sub-complexes (Figure 2C). This revealed that interaction of RYBP with the RING1B-PCGF1 core dimer was responsible for elevated enzymatic activity of the PCGF1-PRC1 holocomplex. In contrast, KDM2B and BCOR appeared to contribute little or nothing to this activity, suggesting that they confer alternative, non-enzymatic functions to the PRC1 complex. Variant PRC1 complexes can contain either RYBP or YAF2, and their inclusion appears to be mutually exclusive, presumably because they bind to the same region of RING1B (Gao et al., 2012; Wang et al., 2010; Tavares et al., 2012). Given the stimulatory activity of RYBP on PRC1, we wanted to determine whether YAF2 was also capable of stimulating PCGF1-RING1B. Therefore, we purified recombinant YAF2 and RYBP and added them to PCGF1-RINGB E3 ligase reactions (Figure 2—figure supplement 1A). Importantly, this revealed that YAF2 also stimulated PCFG1-RING1B activity (Figure 2—figure supplement 1B). Together these observations reveal that RYBP and YAF2 regulate PCGF1-PRC1 activity in vitro, where they act to stimulate the PCGF1-RING1B core dimer and enhance H2AK119ub1 deposition. RYBP stimulates the catalytic core of PCGF1-PRC1. (A) A histone H2AK119 E3 ligase assay monitoring the conversion of H2A to mono-ubiquitylated H2A by western blotting, which demonstrates that the activity of PCGF1-PRC1 requires E1 (UBE1), E2 (UBCH5C), Ubiquitin and ATP. The top panel monitors H2A mono-ubiquitylation with an antibody against total H2A that detects both mono-ubiquitylated and non-ubiquitylated H2A. The bottom panel monitors production of mono-ubiquitylated H2A with an antibody that specifically recognizes H2AK119ub1. (B) An E3 ligase activity assay directly comparing the PCGF1-RING1B catalytic core and the PCGF1-PRC1 holocomplex over increasing enzyme concentrations (two fold dilution series) as examined by western blotting. (C) An E3 ligase activity assay comparing the PCGF1-PRC1 holocomplex and various sub-complexes in which individual and combinations of PCGF1-PRC1 subunits have been omitted (see Figure 1D). This demonstrates that RYBP is the central determinant of E3 ligase activity for the PCGF1-PRC1 complex. The error bars correspond to the S.E.M. of at least two independent experiments. Ectopic targeting of PRC1 complexes to chromatin in vivo had suggested that PCGF1-PRC1 is more efficient at depositing H2AK119ub1 on chromatin than PCGF4-PRC1 (Blackledge et al., 2014). Therefore, we sought to understand whether differences in E3 ligase activity between individual PRC1 complexes are inherent to the PCGF-RING1B catalytic core, or whether RYBP may have selective stimulatory activity. This was important as previous in vitro work had only directly compared the H2AK119ub1 E3 ligase activity of differing PCGF/RING1 assemblies in the context of minimal RING-RING catalytic dimers (Taherbhoy et al., 2015). Furthermore, when intact PCGF(2/4)/RING1 dimers had been examined, differing conclusions were made as to whether RYBP stimulated E3 ligase activity (Tavares et al., 2012; Gao et al., 2012). Therefore to examine these points in more detail, we expressed and purified intact PCGF1-RING1B and PCGF4-RING1B dimers and compared their relative activities in H2AK119 E3 ligase assays (Figure 3A). Interestingly, this revealed that PCGF1-RING1B was significantly more active than PCGF4-RING1B (Figure 3B), indicating that the enzymatic activity of a given PRC1 complex is inherently defined by the PCGF-RING dimer which forms its catalytic core. Given that PCGF1-RING1B is robustly stimulated by RYBP, we were then curious to understand whether RYBP stimulated PCGF4-RING1B. This was an important question as previous studies examining the effect of RYBP on PCGF4-RING1B and the related PCGF2-RING1B dimer had come to differing conclusions, with one study observing no effect on activity and the other claiming elevated H2AK119 E3 ligase activity (Gao et al., 2012; Tavares et al., 2012). In the context of our experiments, we observe a small stimulatory effect when RYBP was added to PCGF4-RING1B (Figure 3B). Despite this low level of stimulation, PCGF4-RING1B-RYBP was still much less active than PCGF1-RING1B-RYBP. Together these observations indicate that the PCGF component of the PRC1 complexes defines the inherent H2AK119 E3 ligase activity of individual PRC1 dimers and that inclusion of RYBP/YAF2 further matures these assemblies into robust enzymes that can efficiently modify chromatin. The PCGF1 catalytic dimer is inherently more active and stimulated more robustly than the PCGF4 catalytic dimer. (A) Coomassie-stained gels showing the recombinant PCGF1-RING1B or PCGF4-RING1B catalytic cores with or without the addition of RYBP. Complexes were affinity-purified via RING1B. PCGF4 and RING1B migrate at the same position on the gel (Figure 3—figure supplement 1). (B) An E3 ligase activity assay comparing PCGF1-RING1B or PCGF4-RING1B in the presence or absence of RYBP. The error bars correspond to the S.E.M. of at least two independent experiments. Our in vitro reconstitution reactions demonstrated that RYBP can control how PRC1 deposits H2AK119ub1. We were therefore interested to understand the molecular nature of this stimulatory activity, as it could have profound implications for how PRC1 functions in vivo. Interestingly, RYBP has been shown to function as an ubiquitin-binding protein via its zinc finger NZF domain (Arrigoni et al., 2006; Fereres et al., 2014). We therefore reasoned that the capacity of RYBP to recognize ubiquitin, perhaps in the form of H2AK119ub1, could account for its stimulatory activity on PRC1. To examine this possibility we generated recombinant RYBP, and RYBP with mutations in the NZF domain that abrogate ubiquitin binding (Arrigoni et al., 2006), and added them to E3 ligase reaction containing PCGF1-RING1B (Figure 4A and B). Importantly, both forms of RYBP stimulated the activity of PCGF1-RING1B to a similar extent (Figure 4B). Given that the ability of RYBP to recognise ubiquitin did not account for its stimulation of PRC1, we wondered whether RYBP may instead affect how the core dimer assembles to function as an H2AK119 E3 ligase. We therefore turned to crosslinking mass spectrometric analyses to examine whether inclusion of RYBP in the complex resulted in any gross alterations in the proximity of individual domains. To address this possibility we directly compared the PCGF1-RING1B dimer (Figure 4C) and the RYBP-PCGF1-RING1B trimer (Figure 4D). Within the PCGF1-RING1B dimer, we observed multiple high-confidence crosslinks between the RING domain of RING1B and its C-terminal ubiquitin-like (UBL) domain, suggesting that there are likely significant intramolecular interactions occurring between these regions (Figure 4C). Intriguingly, most of the RING domain/RING-UBL domain crosslinks within RING1B were lost in the trimeric complex (PCGF1-RING1B-RYBP) (Figure 4D), suggesting that RYBP causes an alteration in PCGF1-RING1B which limits association between its N- and C-terminal domains, possibly to stabilize the formation of an optimally assembled and active E3 ligase. Interestingly, upon closer inspection of our reconstituted complexes (Figure 1D), it was noticed that the level of PCGF1 was reduced in complexes lacking RYBP (Figure 4—figure supplement 1). This is in agreement with our crosslinking mass spectrometry analysis, and suggests that RYBP helps to reconfigure and stabilize the PCGF1-RING1B dimer. Importantly however, reduced PCGF1 inclusion does not explain the effect that RYBP has on the activity of PCGF1/PRC1 complexes, as the presence of RYBP stimulated the relative activity of PRC1 to a much larger extent than can be simply explained by PCGF1 levels alone (Figure 2B and C). Furthermore, RYBP and YAF2 were able to significantly stimulate the activity of pre-existing PCGF1-RING1B assemblies (Figure 2—figure supplement 1B). Future structural work will be imperative to understand the defined biochemical nature of this RYBP-dependent stimulation. RYBP-dependent stimulation of PCGF1-PRC1 is associated with changes in the PCGF1-RING1B dimer but not ubiquitin binding. (A) Coomassie-stained gels showing the recombinant PCGF1-RING1B affinity purified via RING1B with wildtype RYBP or a ubiquitin-binding mutant (RYBP TFAA). (B) An E3 ligase activity assay comparing the activity of PCGF1-RING1B with addition of RYBP or RYBP with mutations in the NZF domain (TF-AA) that abrogate ubiquitin binding. Error bars correspond to the S.E.M. of at least two independent experiments. (C–D) Circos plots illustrating crosslinking mass spectrometry analysis of PCGF1-RING1B in presence or absence of RYBP. In (C) extensive intramolecular crosslinks are observed between the RING1B RING and UBL domains. In (D) these intramolecular crosslinks are largely ablated in the presence of RYBP which makes extensive crosslinks with these regions of RING1B. Blue and orange lines indicate intermolecular and intramolecular crosslinks respectively. Lines are weighted by the statistical confidence of their interaction. The mechanisms that drive and shape H2AK119ub1 in vivo remain very poorly understood. Given our observation that RYBP and YAF2 play a central role in controlling PRC1 complex activity in vitro, we sought to understand whether this activity defines H2AK119ub1 in vivo. To address this possibility, we took advantage of a mouse embryonic stem cell system in which the Rybp gene is flanked by loxP sites and which also expresses a tamoxifen-inducible form of Cre recombinase (Hisada et al., 2012). 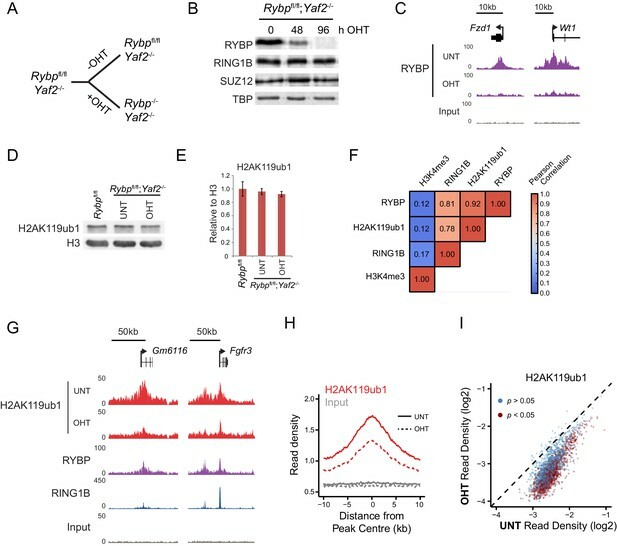 However, this cell line also expresses the RYBP paralogue YAF2, which appears to stimulate PRC1 in a manner similar to RYBP (Figure 2—figure supplement 1), suggesting they could have redundant or overlapping functions in vivo. To circumvent this limitation, we exploited CRISPR/Cas9-based genome editing to delete two essential coding exons in Yaf2 and create a homozygous Yaf2−/− cell line that lacked Yaf2 mRNA and protein (Figure 5—figure supplement 1A–C and Figure 5A). Treatment of the Rybpfl/fl;Yaf2−/− cell line with tamoxifen resulted in a complete loss of RYBP by 96 hr as assessed by western blot (Figure 5B) and at PcG targets as assessed by ChIP-seq (Figure 5C). RYBP is required for H2AK119ub1 at PRC1 targets in vivo. (A) A schematic illustrating the Rybpfl/fl;Yaf2−/− mouse embryonic stem cell model in which the addition of tamoxifen (OHT) leads to deletion of RYBP. (B) Western blot analysis demonstrating that treatment of Rybpfl/fl;Yaf2−/− cells with tamoxifen for 96 hr results in loss of RYBP protein. The levels of the PRC1 component, RING1B, and the PRC2 component, SUZ12, are unchanged. TATA Box Binding Protein (TBP) is included as a loading control. (C) A genomic snapshot from RYBP ChIP-seq analysis in Rybpfl/fl;Yaf2−/− cells before (UNT) and after 96 hr of tamoxifen treatment (OHT) showing that RYBP occupancy on chromatin is lost. (D) Western blot analysis of H2AK119ub1 in Rybpfl/fl ESCs, compared with Rybpfl/fl;Yaf2−/− cells before (UNT) and after 96 hr tamoxifen treatment (OHT). Western blot with a histone H3-specific antibody is shown as a loading control. (E) A quantitation of western blot analysis for H2AK119ub1 relative to histone H3 in Rybpfl/fl ESCs, compared with RYBP/YAF2 deletion indicating no global reduction in H2AK119ub1. Errors bars indicate standard deviation for three biological replicate experiments. (F) Genome-wide correlation of wildtype H2AK119ub1, RYBP, RING1B and H3K4me3 ChIP-seq using 10 kb windows. H2AK119ub1 ChIP-seq correlates well with RYBP and RING1B genome-wide. (G) A genomic snapshot of calibrated H2AK119ub1 ChIP-seq in the Rybpfl/fl;Yaf2−/− mouse embryonic stem cells before (UNT) and after 96 hr tamoxifen (OHT) treatment at two polycomb-occupied target sites indicating significant reductions in H2AK119ub1 in the absence of RYBP. (H) A metaplot illustrating calibrated H2AK119ub1 ChIP-seq read density at peaks of H2AK119ub1 (n = 2407) before (UNT-solid line) and after (OHT- dotted line) tamoxifen treatment. Removal of RYBP has a broad effect on H2AK119ub1. (I) A scatter plot of normalised read densities for calibrated H2AK119ub1 ChIP-seq illustrates reduced H2AK119ub1 signal at nearly all H2AK119ub1 peaks in OHT-treated Rybpfl/fl;Yaf2−/− cells (OHT) when compared to untreated cells (UNT). Red dots correspond to statistically significant reductions in H2AK119ub1. Having established the Rybpfl/fl;Yaf2−/− cell line we then set out to understand if the capacity of RYBP to stimulate PRC1 in vitro would also translate into effects on cellular H2AK119ub1 following RYBP removal. Studying this in a cellular context could however be complicated by previous conflicting observations suggesting that RING1B may, or may not, be destabilised when RYBP is removed in ESCs (Tavares et al., 2012; Morey et al., 2013). To examine this possibility we first determined whether loss of RYBP affected the level of RING1B. In the context or our new Rybpfl/fl;Yaf2−/−conditional system, deletion of RYBP did not lead to an appreciable reduction in total RING1B (Figure 5B), in agreement with our observation that PRC1 complex assembly in vitro is modular (Figure 1D). The stability of the PRC1 complex in the absence of RYBP allowed us to then examine the direct contribution of RYBP to H2AK119ub1 in vivo. Somewhat surprisingly, despite the dramatic affects that RYBP has on H2AK119 E3 ligase activity in vitro, removal of RYBP did not significantly affect total H2AK119ub1 as measured by western blot (Figure 5D and E). Again this contrasts previous observations in which shRNA-mediated knockdown of RYBP led to global reductions in H2AK119ub1 (Tavares et al., 2012; Gao et al., 2012), and suggests that these affects may have been the indirect result of decreased RING1B levels. Given these observations, we reasoned that RYBP may play a more defined or locus-specific role in regulating H2AK119ub1 as had previously been suggested from single gene analysis following RYBP depletion in ESCs (Morey et al., 2013). To address this possibility we exploited a calibrated ChIP-seq approach (Bonhoure et al., 2014; Hu et al., 2015; Orlando et al., 2014) to measure H2AK119ub1 genome-wide in the Rybpfl/fl;Yaf2−/− cells, before and after RYBP ablation. Importantly, H2AK119ub1 signal in wild-type cells was highly correlated with both RING1B and RYBP occupancy genome-wide (Figure 5F). Furthermore, a visual inspection of these data revealed enrichment of H2AK119ub1 at genes associated with Polycomb-mediated repression in embryonic stem cells (Figure 5G). When we compared the levels of H2AK119ub1 before and after RYBP removal at individual Polycomb target sites, we observed clear reductions in H2AK119ub1 (Figure 5G), suggesting that RYBP supports deposition of H2AK119ub1 at these genomic locations. To explore the breadth of these affects, we identified a set of 2407 genomic regions that were enriched for H2AK119ub1. Quantitation of H2AK119ub1 after removal of RYBP revealed widespread effects on H2AK119ub1 (Figure 5H), with approximately 45% of regions showing significant reductions in the levels of H2AK119ub1 (1091/2407; p<0.05). However, this appeared to be an underestimation of the effect, as nearly all PRC1 targets displayed reductions in H2AK119ub1, albeit below the significance threshold (Figure 5I). These effects are consistent with our in vitro observations demonstrating that RYBP shapes the E3 ligase activity of PRC1 complexes. Given the widespread reductions in H2AK119ub1 observed in ChIP-seq, it is perhaps surprising that we did not detect global alterations in H2AK119ub1 by western blot. This is likely due to a proportion of total cellular H2AK119ub1 residing outside of classical polycomb target sites as has been proposed previously in other systems (Lee et al., 2015; Goldknopf et al., 1975). Although our in vitro studies provide compelling evidence that RYBP regulates PRC1 activity, previous work has suggested that RYBP may also contribute to PRC1 function through regulating its stability or targeting (Tavares et al., 2012; Gao et al., 2012). Conversely, single gene studies had suggested that following depletion of RYBP, RING1B targeting to polycomb sites may not be overtly affected (Hisada et al., 2012; Morey et al., 2013). Therefore, having demonstrated that the stability of PRC1 is unaffected following RYBP deletion in the Rybpfl/fl;Yaf2−/− cells (Figure 5B), we set out to test at the genome-scale whether H2AK119ub1 losses following RYBP deletion in vivo were the result of defective PRC1 targeting or supressed E3 ligase activity. To achieve this, we carried out RING1B ChIP-seq before and after tamoxifen treatment of Rybpfl/fl;Yaf2-−/− cells (Figure 6). Initially, we considered RING1B occupancy at PRC1 target sites where H2AK119ub1 was dependent upon RYBP, to examine whether H2AK119ub1 reductions were coincident with reduced chromatin occupancy of PRC1. However, visual inspection of several of these sites revealed that despite displaying large decreases in H2AK119ub1, RING1B occupancy was often unaffected (Figure 6A). We extended this analysis genome-wide (Figure 6B), and found that the majority of PRC1 target sites (78%; 1870/2407) failed to show a significant change in RING1B occupancy (Figure 6B) and we validated these observations at a number of sites using ChIP quantitative PCR analysis (Figure 6—figure supplement 1). Indeed, there were only a modest number of sites showing decreases in RING1B binding (20%; 487/2407) (Figure 6C). Importantly, following RYBP deletion we observed clear and widespread reductions in H2AK119ub1 at PRC1 target sites where RING1B occupancy remained unchanged. These observations are in agreement previous observations at selected target sites following shRNA-mediated knockdown of RYBP which also appeared to show loss of H2AK119ub1 in the absence of perturbed RING1B binding (Morey et al., 2013). Interestingly, the subset of PRC1 targets which lost RING1B appeared on average to exhibit a unique depletion of H2AK119ub1 in the centre of the peak when compared to other PRC1 targets (Figure 6C). This was coincident with a more highly positioned TSS at the centre of the peak but did not appear to correspond with a depletion of nucleosomes (Figure 6—figure supplement 2A and B). Furthermore, these sites tended to be more enriched for variant PRC1 (RYBP), as opposed to canonical PRC1 (CBX7) occupancy, suggesting that these PRC1 targets might depend more on RYBP for normal H2AK119ub1 and RING1B occupancy than canonical targets (Figure 6—figure supplement 2C) as suggested previously (Morey et al., 2013). Together, these genome-wide observations strongly support our in vitro conclusions that RYBP stimulates the E3 ligase activity of PRC1, and reveal that decreases in H2AK119ub1 at PRC1 target sites are not due to defects in targeting PRC1. 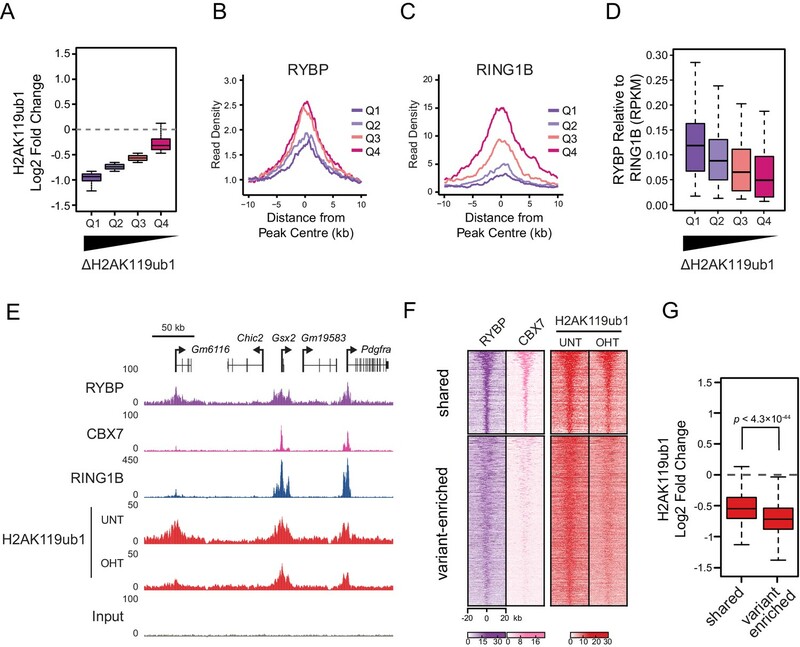 RYBP regulates the activity, not chromatin occupancy, of PRC1 in vivo. (A) A genomic snapshot of RING1B and H2AK119ub1 ChIP-seq in Rybpfl/fl;Yaf2−/− mouse embryonic stem cells before (UNT) and after 96 hr tamoxifen (OHT) treatment demonstrates that decreases in H2AK119ub1 occur in the absence of altered RING1B occupancy. (B–C) Metaplots illustrating H2AK119ub1 and RING1B ChIP-seq read density at H2AK119ub1 peaks with (n = 487) or without (n = 1870) significant reductions in RING1B occupancy before (UNT-solid line) and after tamoxifen treatment (OHT-dotted line). RYBP loss affects the levels of H2AK119ub1 (B-bottom panel) even though RING1B occupancy is unaffected (B-upper panel) indicating RYBP stimulates PRC1 activity at target sites in vivo. RYBP plays a central role in stimulating PRC1 in vivo, and virtually all H2AK119ub1-enriched regions show some dependency on RYBP for normal H2AK119ub1 (Figure 5I). Nevertheless it was clear that at individual sites the magnitude of H2AK119ub1 loss often differed greatly, perhaps suggesting that features inherent to individual Polycomb target sites could dictate their reliance on the stimulatory activity of RYBP. To examine this possibility we divided PRC1 target sites into quartiles based on their relative loss of H2AK119ub1 (Figure 7A). Initially, we examined the levels of RYBP at these different groups to determine whether the effect on H2AK119ub1 following loss of RYBP was not simply related to the absolute amount of RYBP at a given target site (Figure 7B). Interestingly, RYBP enrichment was similar across groups of RYBP-dependency, and counterintuitively more lowly occupied sites often exhibited more profound reductions in H2AK119ub1. We then examined the occupancy of the PRC1 catalytic core component RING1B at these same sites, and observed that the sites which were most dependent upon RYBP for H2AK119ub1 had the lowest occupancy of RING1B (Figure 7C). This suggests that sites with limiting amounts of PRC1 have a more defined requirement for RYBP-dependent stimulation to achieve normal H2AK119ub1. To explore this possibility, we calculated the ratio of RYBP relative to RING1B at PRC1 target sites over the range of H2AK119ub1 dependencies (Figure 7D). This revealed that the sites where loss of RYBP most profoundly affected H2AK119ub1 exhibited the highest ratios of RYBP to RING1B (Figure 7D and E). At these PRC1 target sites it appears that the inherent activity of the core catalytic complex is insufficient to sustain H2AK119ub1, and that RYBP-dependent stimulation is required to define normal H2AK119ub1 levels. We then wondered whether dependency on RYBP might also be related to the occupancy of canonical PRC1 at these sites. Indeed, PRC1 targets that were occupied by RYBP but displayed reduced levels of CBX7 (i.e. ‘variant-enriched’) tended to show the largest reductions in H2AK119ub1 following RYBP removal (Figure 7F and G), whereas variant and canonical PRC1 occupied sites (i.e. ‘shared’) appeared to rely on RYBP to a lesser extent. Intriguingly, shared-PRC1 targets, tended have the largest polycomb domains, and were enriched for genes related to sequence-specific transcription factor binding (Figure 7—figure supplement 1), perhaps reflecting a contribution of both variant and canonical PRC1 in shaping H2AK119ub1 at these regulatory genes. Interestingly, and in contrast to previous reports (Morey et al., 2013), our ChIP-seq based analysis of RYBP binding did not reveal a class of PcG target sites that were enriched for canonical PRC1 (CBX7) but lacked variant PRC1 (RYBP). This suggests that canonical PRC1 binding occurs at PcG target sites that are also occupied by variant PRC1. Together, our detailed genome-wide analysis in vivo establishes a clear role for RYBP in stimulating the H2AK119ub1 E3 ligase activity of PRC1, particularly at variant PRC1-enriched sites with low levels of RING1B. RYBP-dependent stimulation is essential for H2AK119ub1 at sites with low PRC1 occupancy. (A) A box plot illustrating the separation of H2AK119u1 peaks into quartiles based on their relative reduction in H2AK119ub1 upon deletion of RYBP. This indicates that all H2AK119ub1 peaks experience a decrease in H2AK119ub1 following RYBP removal, but some sites (e.g. Q1) are more dependent upon RYBP than others (e.g. Q4) (B–C) Metaplots illustrating the RYBP and RING1B ChIP-seq read density over the H2AK119ub1 quartiles identified in (A). Quartiles that are most dependent on RYBP for H2AK119ub1 (i.e. Q1 and Q2) have lower RYBP and RING1B occupancy. (D) A box plot illustrating that the quartiles which are most dependent on RYBP have the largest enrichment of RYBP relative to RING1B. (E) A genomic snapshot depicting three polycomb target sites which display varying dependencies on RYBP for their H2AK119ub1. The Gm6116 gene (highlighted in grey) has low occupancy of RING1B and CBX7, and is almost completely reliant on RYBP for H2AK119ub1. In contrast the Gsx2 and Pdgfra genes have high RING1B and CBX7 occupancy and are less dependent on RYBP for their H2AK119ub1. This indicates that RYBP plays a more pronounced role stimulating PRC1 activity at sites with limiting levels of RING1B. Furthermore, sites that are highly dependent on RYBP appear to be depleted of canonical PRC1. (F) A heatmap illustrating H2AK119ub1 peaks clustered into variant-enriched PRC1 and variant and canonical PRC1 (shared) sites based on RYBP (variant PRC1) and CBX7 (canonical PRC1) levels. Both variant-enriched and shared PRC1 target sites show a reduction in H2AK119ub1 following deletion of RYBP. (G) A box plot indicating the alterations in H2AK119ub1 at shared or variant-enriched PRC1 target sites. The p value denotes statistical significance calculated by a Wilcoxon signed rank test. We and others have recently discovered that PRC1 can regulate the targeting of PRC2 through its capacity to recognize H2AK119ub1 (Blackledge et al., 2014; Cooper et al., 2014; Kalb et al., 2014). 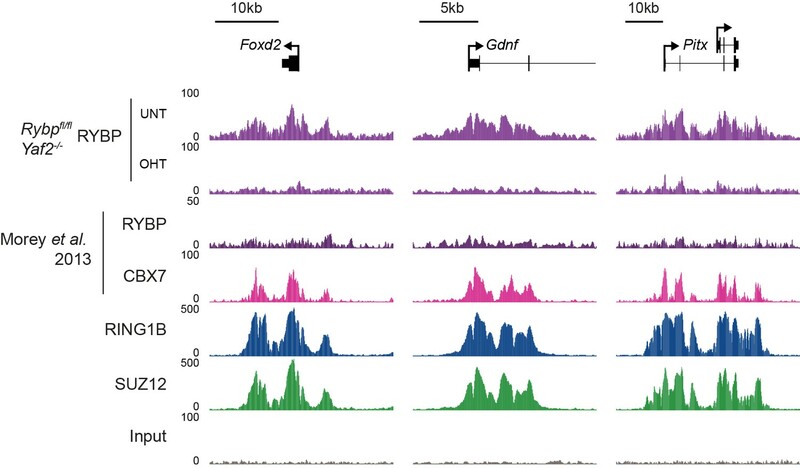 This, coupled with CBX-dependent recognition of H3K27me3 by canonical PRC1 complexes (Bernstein et al., 2006; Fischle et al., 2003; Min et al., 2003), could effectively create a feedback mechanism sufficient to help sustain Polycomb chromatin domains in a histone modification-dependent manner. Given that RYBP stimulates the E3 ligase activity of PRC1, we wondered whether this activity may play a role in these proposed feedback mechanisms. To address this we performed ChIP-seq for SUZ12, a core component of PRC2, and H3K27me3 in the Rybpfl/fl;Yaf2−/− cells before and after tamoxifen treatment (Figure 8A). Strikingly, deletion of RYBP resulted in genome-wide reductions in H3K27me3 at Polycomb target sites (Figure 8A and B). However, like H2AK119ub1, H3K27me3 reductions were not evident from western blot analysis of total histones, suggesting that H3K27me3 is affected most profoundly at classical Polycomb target sites and not the larger pool of H3K27me3 which is proposed to exist elsewhere in the genome (Figure 8—figure supplement 1) (Grzybowski et al., 2015). Importantly, H3K27me3 reductions at Polycomb target sites occurred without any apparent loss in the chromatin occupancy of the PRC2 component SUZ12 (Figure 8A and C, Figure 8—figure supplement 2), suggesting that the observed decreases in H3K27me3 likely arise as a result of reduced activity of the PRC2 complex. Like the observed changes in H2AK119ub1 (Figure 7F and G), the largest reductions in H3K27me3 were evident at variant-enriched PRC1 target sites (Figure 8D), consistent with a more defined role for RYBP in maintaining PcG-associated histone marks at these regions. Importantly, reductions in H3K27me3 across all PRC1 target sites correlated closely with reductions in H2AK119ub1 (Figure 8E), indicating that the effects on H2AK119ub1 and H3K27me3 are linked and directly related to the activity of RYBP. These important observations demonstrate that RYBP-dependent H2AK119ub1 shapes the activity of PRC2 in depositing H3K27me3, and suggests that the observed stimulation of PRC2 by nucleosomes containing H2A mono-ubiquitylation in vitro is also relevant in vivo (Kalb et al., 2014). RYBP-dependent H2AK119ub1 shapes PRC2 activity. 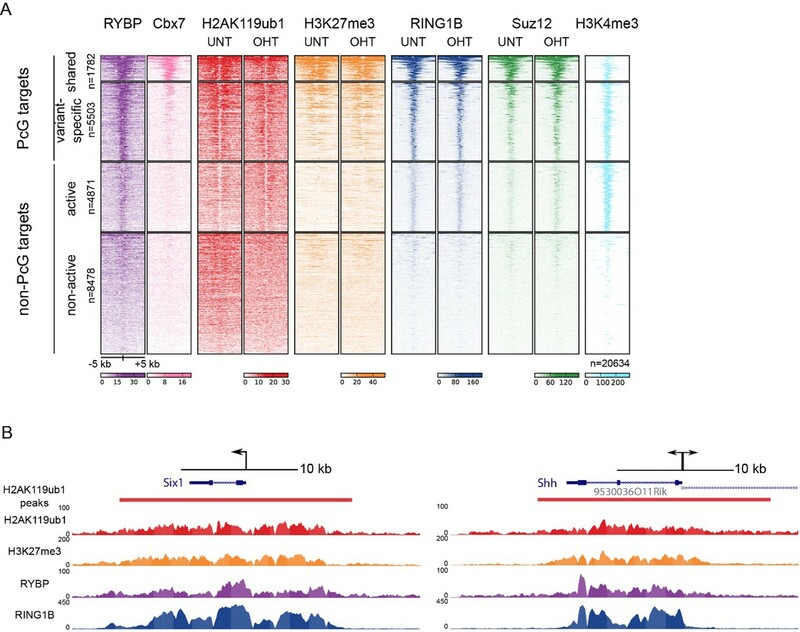 (A) A genomic snapshot of H3K27me3, SUZ12 and H2AK119ub1 ChIP-seq in Rybpfl/fl;Yaf2−/− mouse embryonic stem cells before (UNT) and after tamoxifen (OHT) treatment. At these target sites there are reductions in H3K27me3 in the absence of changes in SUZ12 occupancy following RYBP deletion. (B-C) Metaplots illustrating ChIP-seq read density for H3K27me3 (B) and SUZ12 (C) in the Rybpfl/fl;Yaf2−/− mouse embryonic stem cells before (UNT-solid line) and after tamoxifen (OHT-dotted line) treatment. Removal of RYBP results in widespread loss of H3K27me3 despite largely unaffected occupancy of SUZ12. (D) A box plot indicating the alterations in H3K27me3 at shared or variant-enriched PRC1 target sites. The p value denotes statistical significance calculated by a Wilcoxon signed rank test. (E) A scatter plot showing changes in H2AK119ub1 and H3K27me3 normalised read densities at H2AK119ub1 peaks after deletion of RYBP. This illustrates that the fold change in H2AK119ub1 and H3K27me3 are related to each other at individual sites following loss of RYBP. R2 and cor denote coefficient of determination for linear regression model and the pearson correlation coefficient respectively. (F) A box plot illustrating the changes in H2AK119ub1 and H3K27me3 at H2AK119ub1 peaks divided into groups based on whether RYBP deletion resulted in no significant loss of RING1B or SUZ12 (No Sig Loss, n = 1947), loss of RING1B only (△RING1B, n = 319), loss of SUZ12 only (△SUZ12, n = 38) or loss of both RING1B and SUZ12 (△RING1B △SUZ12, n = 103). This indicates that sites susceptible to loss of RING1B and/or SUZ12 experience the greatest relative reductions in H2AK119ub1 and H3K37me3. Given that PRC1 and PRC2 complexes recognize and bind to the histone modifications that they place, it was somewhat surprising to us that the reductions in H2AK119ub1 and H3K27me3 following RYBP/YAF2 deletion did not result in more widespread effects on PRC1 and PRC2 occupancy. One possible explanation is that normal PcG protein occupancy can only be effectively maintained as long as histone modifications remain above a certain level or threshold. Conversely, if this threshold is crossed, effective Polycomb chromatin occupancy may no longer be maintained, and the Polycomb chromatin domain could begin to erode. If this were the case, one might predict that thresholds for Polycomb domain erosion would differ between individual target sites. We therefore hypothesized that in the context of our experiments, erosion of Polycomb chromatin domains following RYBP deletion might occur at the sites that experienced the greatest relative reductions in their Polycomb-associated histone modifications. To examine whether this was the case, we examined the subset of Polycomb target sites that experienced significant losses in PRC1 and PRC2 occupancy following RYBP deletion, and compared these to target sites at which occupancy was unaffected. Interestingly, we observed that the sites with the most profound losses of H2AK119ub1 and H3K27me3 were the same sites that showed reductions in PRC1 and PRC2 (Figure 8F). Together these observations reveal two important and fundamental features associated with the function of Polycomb chromatin domains. Firstly, there is an intimate relationship between the histone-modifying activities of PRC1 and PRC2 at target sites, which is regulated by auxiliary PcG complex subunits and not simply dictated by occupancy of PRC1/PRC2 core catalytic subunits. This is evident in instances where RYBP removal leads to reductions in both H2AK119ub1 and H3K27me3, without major alterations in PcG complex occupancy. Secondly, the occupancy of PcG complexes at target sites is not driven in a linear fashion by H2AK119ub1 and H3K27me3 levels. However, if activity-based communication between the PcG complexes is compromised there appears to be a modification threshold below which complex occupancy can no longer be sustained. Again this is evident following RYBP removal, where sites displaying the greatest loss of H2AK119ub1 and H3K27me3 also show reductions in PcG complex occupancy. Studies in mice have demonstrated that RYBP plays a fundamental role in early development (Pirity et al., 2005), and that it is also important at later developmental stages including haematopoiesis (Calés et al., 2016), presumably due to its involvement in PcG-mediated gene regulation (Tavares et al., 2012). Furthermore, RYBP-deficient Drosophila die at varying stages during development and RYBP can function as an enhancer of PcG phenotypes (Gonzalez et al., 2008). Given the widespread effects that RYBP has on shaping H2AK119ub1 and H3K27me3, and the erosion of normal Polycomb chromatin domains that ensues at some target sites following RYBP removal, we wondered whether genes associated with these target sites were aberrantly transcribed. To this end, we isolated nuclear RNA from cells before and after RYBP deletion and carried out RNA-seq analysis. This revealed that loss of RYBP resulted in a limited number of robust and statistically significant transcriptional changes (Figure 9A), in agreement with previous studies examining gene expression by microarray analysis in RYBP deleted cells (Hisada et al., 2012). Consistent with a role for RYBP in shaping PRC1-dependent gene repression, more genes were significantly upregulated (n = 230) than downregulated (n = 37), and these tended to be lowly expressed genes (Figure 9A). Furthermore, when we compared these gene expression changes to those observed in the complete absence of PRC1 activity (RING1A−/−;RING1B−/−) (Schoenfelder et al., 2015), most RYBP-repressed genes fell within the set of genes that are also regulated by RING1A/B (Figure 9B). In addition, when we compared the expression of genes that were upregulated following RYBP loss to the gene expression changes in cells where RING1B was catalytically inactivated (RING1B I53A) (Illingworth et al., 2015), RYBP-dependent genes were also partially upregulated, although the effects in this context were modest (Figure 9—figure supplement 1). The extent of gene reactivation at Polycomb target genes following RYBP removalwas generally of lower magnitude than gene reactivation following deletion of RING1A/RING1B (Figure 9C), in agreement with our observations that RYBP stimulates, but is not absolutely required for, PRC1 activity and occupancy. Furthermore, both shared and variant-enriched PRC1 target sites were subject to reactivation following removal of RYBP (Figure 9—figure supplement 2). Loss of RYBP culminates in gene reactivation at sites where Polycomb chromatin domains are compromised. (A) An MA plot illustrating differential gene expression analysis based on nuclear RNA (nucRNA)-seq in the Rybpfl/fl;Yaf2−/− mouse embryonic stem cells before and after tamoxifen treatment. Log2 fold change of nucRNA is plotted against mean transcriptional level in wildtype cells. Significance values represent adjusted p values calculated by DESeq2. (B) A Venn diagram illustrating that genes upregulated after deletion of RYBP are a subset of genes upregulated upon deletion of the PRC1 catalytic core proteins RING1A/RING1B. (C) A box plot comparing the log2 fold change in nucRNA levels following loss of RYBP or RING1A/RING1B at TSS marked by H2AK119ub1 peaks (PcG; n = 1490) or TSS without H2AK119ub1 (Non-PcG; n = 12,911). This reveals that Polycomb target TSS are the most affected genes, and that the average level of upregulation after loss of RYBP is less than the upregulation following deletion of RING1A/RING1B. p values denote statistical significance calculated with Wilcoxon signed rank test. (D) A genomic snapshot of two genes upregulated following loss of RYBP. RNA-seq reads are separated by strand. Following RYBP deletion, both genes exhibit reductions in TSS-associated RING1B and SUZ12, as illustrated by ChIP-seq for RING1B and SUZ12 before (UNT) and after tamoxifen (OHT) treatment. (E) Metaplots illustrating that TSS occupancy of RING1B and SUZ12 are reduced after deletion of RYBP/YAF2 at upregulated genes (n = 230). (F) A scatter plot illustrating that increases in gene expression broadly correlate with decreases in RING1B occupancy at the TSS (±500 bp). Significant reductions in RING1B are depicted as red dots. Having identified the genes that were most dependent on RYBP for transcriptional repression, we were keen to examine how these effects on transcription were related to any associated Polycomb chromatin domains. We reasoned that if the integrity of a Polycomb chromatin domain was required for normal transcriptional repression, one might expect that gene reactivation following RYBP loss would correspond to sites where there was a loss of PcG complex occupancy. Indeed, when we examined individual RYBP-dependent genes, increased transcription was often coincident with TSS-associated decreases in PcG complex occupancy (Figure 9D), although this was more apparent for PRC1 than PRC2 (Figure 9E; Figure 9—figure supplement 3). When we extended this analysis genome-wide there was a very clear relationship, albeit not perfectly linear, between reduction of PRC1 occupancy at TSSs and increased gene expression (Figure 9F). Consistent with a role for PcG systems in helping to maintain genes in a repressed state in tissues where they should not normally be expressed (Klose et al., 2013; Riising et al., 2014; Voigt et al., 2013), the magnitude of gene reactivation events was often modest. This likely reflects genes that are in a very lowly transcribed or off state, transitioning to a more transcribed but not fully activated state. This is presumably because the signals necessary to drive transcriptional activation of these genes are low or absent in embryonic stem cells. Together, our transcription and Polycomb chromatin domain analyses reveal an activity-based communication between PcG complexes regulated by RYBP-dependent stimulation of PRC1. Furthermore it provides clear evidence that the histone modifying activities of PRC1 and PRC2 underpin feedback mechanisms that are important for maintaining Polycomb chromatin domains (Blackledge et al., 2015), counteracting inappropriate gene activation signals, and shaping normal gene repression, at least at a subset of polycomb target sites. PcG proteins play an important chromatin-based role in controlling gene expression. The PRC1 and PRC2 complexes work together to achieve this, and in vertebrates both their occupancy on chromatin and functionality appear to rely, at least in part, on their capacity to modify histones. However, mechanisms controlling the activity of PRC1, and its relationship with PRC2, remain poorly understood. Here we reveal a defined requirement for specific PCGF components and the auxiliary subunits RYBP/YAF2 in regulating the H2AK119 E3 ligase activity of PRC1 in vitro (Figures 1–4). In vivo, RYBP plays a central role in shaping normal H2AK119ub1 at Polycomb target sites (Figure 5) where it functions to stimulate the E3 ligase activity of PRC1 (Figures 6 and 7) and regulate PRC2-dependent H3K27me3 (Figure 8). At a subset of Polycomb target sites, the absence of RYBP leads to a more profound effect on histone modifications leading to Polycomb chromatin domain erosion (Figure 8) and inappropriate reactivation of gene expression (Figure 9). Together this extends our understanding of the interesting and important activity-based communication between PcG complexes that has been previously proposed from in vitro studies (Kalb et al., 2014), and demonstrates that the enzymatic activity of PcG complexes can communicate through chromatin in vivo in order to maintain normal PcG function in gene regulation. A striking and central conclusion from our enzymatic analysis of PRC1 complexes in vitro was that the enzymatic activity of PRC1 is determined not only by its interaction with auxiliary factors like RYBP/YAF2 but also the PCGF protein that forms the PCGF/RING1 catalytic core. This therefore suggests that the activity of individual PRC1 complexes is likely to depend upon the inclusion of specific PCGF proteins and to be highly regulated in vivo. An important focus for future work will be to directly compare the E3 ligase activities of other less well-characterized PRC1 complexes, to understand how widespread these regulatory mechanisms are amongst distinct PRC1 assemblies, including those PRC1 complexes formed by PCGF3/5/6. In an important first step towards achieving this, a recent study examined PCGF1–6/RING1 catalytic dimers and concluded that they displayed little inherent difference in their H2AK119 E3 ligase activity on nucleosome substrates in vitro (Taherbhoy et al., 2015). However, these experiments relied on truncated proteins which lack important domains, including the C-terminus of RING1 which is the interaction site for RYBP/YAF2 (Wang et al., 2010). In contrast our observations using full length proteins demonstrate that PRC1 activity is governed by the nature of the catalytic dimer and the stimulatory activity of auxiliary factors like RYBP/YAF2. An important focus of future work will also rely on understanding the relative contribution of individual PRC1 complexes in placing H2AK119ub1 in vivo, given that RYBP/YAF2 appears to interact with diverse PRC1 complexes. As we begin to learn more about the mechanisms that shape PRC1-dependent E3 ligase activity, our understanding of how this contributes towards PcG system function in gene regulation and development remains an important and outstanding question. Indeed, it still remains incompletely defined how the H2AK119ub1-dependent and independent activities of PRC1 are leveraged by the PcG systems to regulate gene expression, particularly in mammals. However, early biochemical work very clearly demonstrated a structural role for PRC1 in chromatin compaction and counteracting chromatin remodelling in vitro, independently of H2AK119ub1 (Grau et al., 2011; Francis et al., 2004). Furthermore, RING1B null cells which display transcriptional reactivation and chromatin decompaction of the PcG-occupied Hox loci, are rescued of these deficiencies with a form or RING1B lacking catalytic activity, suggesting a structural role on chromatin for PRC1 in this context (Eskeland et al., 2010). In agreement with a role for canonical PRC1 in shaping chromatin structure at PcG target sites, the PHC component of canonical PRC1 can polymerize in vitro and this activity appears to be import for the formation of cytologically identifiable structures referred to as ‘polycomb bodies’ (Kim et al., 2002; Isono et al., 2013). Similar studies in Drosophila have also provided evidence via super resolution imaging that Polycomb body formation relies on Ph (orthologous to mammalian PHC) to shape chromatin domains (Boettiger et al., 2016; Wani et al., 2016) and perturbation of Ph in Drosophila leads to widespread effects on normal gene repression (Lagarou et al., 2008). This abundance of work clearly indicates that PRC1 has essential structure-based effects on chromatin that are related to normal PcG-dependent gene regulation and in some cases this appears to be independent of the E3 ligase activity of PRC1. Consistent with H2AK119ub1-independent roles for PRC1 in normal Drosophila development, a catalytic mutant of the Drosophila RING1 orthologue (Sce1) is less phenotypically severe than that of Sce1 null animals (Pengelly et al., 2015). Furthermore, mutation of histone H2A such that it is no longer a target for PRC1-dependent mono-ubiquitylation did not lead to Hox gene misregulation in Drosophila imaginal disc clones, suggesting that H2A ubiquitylation is not required to maintain repression of these PcG target genes (Pengelly et al., 2015). Similarly a Ring1bI53A/I53A mouse model, in which the E3 ligase activity of RING1B-containing PRC1 complexes is perturbed, indicated that the catalytic activity of RING1B is also not essential for early mouse development, with Ring1bI53A/I53A mice succumbing to embryonic lethality at a later embryonic stage than Ring1b-null mice (Illingworth et al., 2015; Voncken et al., 2003). Because these Ring1b mouse models do not completely phenocopy each other it would suggest that RING1B may contribute functions during mammalian development that are independent of H2A mono-ubiquitylation, possibly related to its role in chromatin compaction (Eskeland et al., 2010; Francis et al., 2004). However, it still remains unclear whether early mammalian development and normal polycomb mediated repression can be sustained in the absence of PRC1 E3 ligase activity, as this requires the generation of a mouse model that lacks the enzymatic activity of RING1A and RING1B, both of which are expressed in early development and contribute to deposition of H2AK119ub1 and gene repression (de Napoles et al., 2004; Endoh et al., 2008). Interestingly, however, Ring1bI53A/I53A embryonic stem cells have dramatically reduced levels of H2AK119ub1, show reductions in H3K27me3 and reactivate a subset of PcG target genes (Illingworth et al., 2015). This scenario is reminiscent of the reductions in H2AK119ub1 and H3K27me3 that occur following loss of RYBP-dependent stimulation of PRC1. Together these observations support the general argument that in mammals H2AK119ub1 helps to shape communication between PRC1 and PRC2 in order to sustain normal Polycomb chromatin domain function in gene regulation. However it is clear that a more detailed analysis of both RING1A and RING1B activity will be imperative in defining how important H2AK119ub1 is for mammalian development and gene regulation by the PcG system. PRC1 and PRC2 complexes have the capacity to recognise H2AK119ub1 and H3K27me3, and it has been proposed that this supports PcG protein binding to chromatin (Blackledge et al., 2015; Kalb et al., 2014; Margueron et al., 2009; Min et al., 2003; Wang et al., 2004b; Simon and Kingston, 2013). Here we show that RYBP deletion causes reductions in H2AK119ub1 and H3K27me3 yet PRC1 and PRC2 occupancy remains largely intact. However, a subset of PcG target sites exhibit larger reductions in H2AK119ub1 and H3K27me3 and have pronounced losses of PcG complex occupancy. Based on these observations we speculate that activity-based communication between PRC1 and PRC2 may support PcG complex occupancy through a histone modification-dependent thresholding mechanism. In the context of such a mechanism we speculate that the majority of PcG target genes have H2AK119ub1 and H3K27me3 levels that are in excess of that required to support normal PRC1 and PRC2 binding. However, if H2AK119ub1 and H3K27me3 levels fall below a given threshold, as some sites do in the absence of RYBP, normal activity-based communication between PRC1 and PRC2 can no longer be maintained, leading to a reduction in PcG protein occupancy and an increased propensity for gene reactivation. If histone modification-dependent thresholding mechanisms contribute at least at some sites to the function of the Polycomb system, how or why might this be beneficial to the control of gene expression? Given the highly dynamic nature of PRC1 and PRC2 interactions with chromatin (Fonseca et al., 2012), histone modifications could provide a form of local epigenetic memory to bridge the intervening time between individual engagement events to reinforce PcG protein occupancy. Assuming that PcG protein occupancy is important for gene repression and that histone modifications can stabilize PcG protein binding, it would seem sensible that some fluctuation in histone modification levels would need to be tolerated in order to protect the stability of the PcG system at individual sites. However, this hysteresis could be rapidly counteracted by altering the activity of individual PcG complexes, or by removing their associated histone modifications. In both scenarios this would impair PcG complex occupancy and render these normally inactive states reversible and responsive to strong gene activation signals during cell lineage commitment. In combination with chromatin-modifying activities of the Trithorax group systems that are associated with gene activation, this could support a form of chromatin bistability at gene regulatory elements, as we and others have previously proposed, to allow switch-like activation of gene expression (Deaton and Bird, 2011; Klose et al., 2013; Steffen and Ringrose, 2014; Voigt et al., 2013). Interestingly, alterations in the histone modifying activities of PcG complexes are key molecular defects associated with various cancers, suggesting that perturbing PcG-associated histone modifications, or potentially altering histone modification thresholds, may be important in the pathological adaptation of gene expression in cancer (Scelfo et al., 2015). Clearly more work is required to understand the relative contributions of the histone modification-dependent and -independent activities of PcG complexes to both chromatin structure and gene repression at polycomb chromatin domains. In conclusion, our enzymatic analysis of PRC1 in vitro and genomic dissection of how RYBP shapes its activity in vivo, reveal an interesting activity-based communication between Polycomb repressive complexes on chromatin. Furthermore, they indicate that histone modification thresholds could play an important and previously unrealized role in shaping Polycomb chromatin domain function in the context of gene regulation. Mouse Ring1b, Pcgf1, Rybp, Bcor and Kdm2b (short isoform) were cloned into the Multibac plasmid set. Acceptor and donor plasmids were recombined using Cre recombinase (NEB, Ipswich, MA) as previously described (Bieniossek et al., 2012) and transfected into SF21 cells to make infectious baculovirus particles. Baculoviruses were then used to express proteins in SF21 cells. Baculovirus expressed proteins were then extracted and affinity purified via a FLAG-tagged RING1B subunit on FLAG affinity resin (Sigma, St Louis, MO) and eluted under native conditions using a 1x FLAG peptide (GL Biochem, Shanghai, China) with the lysis buffer containing 10 mM Tris (pH 8.0), 500 mM NaCl, 4 mM MgCl2, 2 mM DTT, 20% glycerol (v/v), cOmplete Protease Inhibitor Cocktail (Roche, UK), wash buffer containing 20 mM HEPES (pH 7.9), 150 mM NaCl, 2 mM MgCl2, 1 mM DTT, 15% glycerol (v/v), cOmplete Protease Inhibitor Cocktail, dilution buffer containing 10 mM Tris (pH 8.0), 10% glycerol (v/v), 0.02 % NP-40, and elution buffer consisting of wash buffer with 0.2 mg/mL 1x FLAG peptide. Mouse Rybp and Yaf2 were cloned into pNIC28 and transformed into E. coli Rosetta2 cells; mutagenesis of Rybp was carried out using the QuikChange II mutagenesis kit (Agilent). His-tagged proteins were purified on Co-Talon resin using the same buffers as for FLAG purification, but with the exception of DTT and the addition of 10 mM imidazole to the wash buffer, and 150 mM imidazole to the elution buffer instead of FLAG peptide. This was followed by anion exchange chromatography (HiTrap Q FF; GE Healthcare, UK). Protein crosslinking was carried out as previously described (Leitner et al., 2014). 30 µg of PRC1 protein complex was crosslinked with BS3 (Creative Molecules) for 30 min at 37°C. The concentration of BS3 was optimised for each complex to prevent over-crosslinking as analysed by SDS-PAGE. Crosslinking reactions were quenched with 1 M NH4HCO3 to a final concentration of 50 mM and incubated at 37°C for 20 min. Crosslinking reactions were then evaporated to near-dryness in a vacuum centrifuge, and urea was then added to a final concentration of 6 M. Disulfide bonds were reduced with TCEP for 30 min at 37°C, followed by iodoacetamide treatment for 30 min at room temperature in the dark, and the reaction mixture was then diluted with 50 mM NH4HCO3 to a final concentration of 1 M urea. Samples were then digested overnight with trypsin (Promega, Madison, WI) at a 1:50 enzyme:substrate ratio, desalted using a C18 Sep-pak cartridge (Waters, UK) and evaporated to dryness before being resuspended in 70% H2O/30% ACN/0.1% TFA and subjected to gel filtration using a Superdex Peptide 10/300 GL column (GE Healthcare). Peak fractions corresponding to crosslinked peptides were then combined and analysed by liquid chromatography tandem mass spectrometry (LC-MS/MS) using an Orbitrap Elite (ThermoScientific, Waltham, MA) as described previously (Adam et al., 2011). MZXML data files were analysed using the XQuest software package as described (Leltner et al., 2014). Data were represented using Circos with crosslinks weighted by confidence score (generated by XQuest). A confidence score cut-off > 15 was chosen by a combination of FDR < 10% and validation of crosslinks wherever possible using known proximities from crystal structures (lysine α-carbons separated by <27 Å). Nucleosomes were reconstituted as previously described (Dyer et al., 2004). Recombinant Xenopus histones were expressed in E. coli BL21(DE3) pLysS and purified from inclusion bodies via Sephacryl S-200 gel filtration (GE Healthcare). Stoichiometric amounts of each core histone were incubated together under high salt conditions (2 M NaCl) and the resulting histone octamer purified using a Superdex 200 gel filtration column (GE Healthcare). 216 bp DNA carrying the nucleosome-positioning 601 sequence was PCR amplified from the pGEM-3Z 601 plasmid and purified using a Resource Q anion exchange column (GE Healthcare). Purified DNA, in slight excess to octamers, was mixed together in 2 M NaCl and diluted stepwise with 10 mM Tris (pH 7.5) to reach a final concentration of 100 mM NaCl. The reconstituted nucleosomes were then analysed on a 0.8% Tris-borate agarose gel, and concentrated using a 5000 MWCO spin concentrator (GE Healthcare). E3 ligase assays were performed in the presence of reconstituted PRC1 and nucleosomes, with the addition of UBE1 (Boston Biochem), UbcH5c (Boston Biochem), methylated ubiquitin (Boston Biochem) and ATP (Life Technologies). Concentrations of E1, E2 and ubiquitin were pre-optimised such that reactions were pseudo-first order with respect to PRC1. Ubiquitylation reactions were carried out in 50 mM Tris (pH 7.5), 2.5 mM MgCl2 and 0.5 mM DTT. E1, E2, ubiquitin and ATP were pre-incubated for 20 min at 37°C, followed by addition of PRC1 and nucleosomes (0.35 µM final concentration), and then incubated at 37°C for 1 hr. Reactions were quenched with 5 mM EDTA and SDS-PAGE loading buffer (2% SDS, 100 mM Tris-HCl (pH 6.8), 100 mM DTT, 10% glycerol, 1 mg/mL bromophenol blue), boiled for 5 min, and loaded onto SDS-PAGE gels for western blot analysis. Western blots were probed with antibodies specific for histone H2AK119ub1 (Farcas et al., 2012) or histone H2A (Millipore 07–146), followed by incubation with LiCOR IRDye secondary antibodies (800CW goat anti-rabbit and goat anti-mouse). Westerns were imaged using the LiCOR Odyssey Fc imaging system, and the fraction of H2AK119ub1 relative to total H2A (non-ubiquitylated H2A plus H2AK119ub1) was quantified. Data were visualised and dose-response curves fitted using GraphPad Prism 6.0. Rybpfl/fl mouse embryonic stem cells, which were previously described and validated (Hisada et al., 2012), were grown in DMEM (Gibco, Carlsbad, CA) supplemented with 15% FBS, 10 ng/mL leukemia-inhibitory factor, penicillin/streptomycin, beta-mercaptoethanol, L-glutamine and non-essential amino-acids. Within our laboratory, cells were regularly tested to ensure the absence of mycoplasma contamination. sgRNAs for Yaf2 (Guide 1: TCTGATCGAGGGGCGACTTT; Guide 2: CGCATGGAACGGCACGGCAC) were cloned into pSpCas9(BB)-2A-Puro (plasmid 48139; Addgene, Cambridge, MA) using a previously described protocol (Ran et al., 2013). Cells were transfected with Cas9-sgRNA plasmids using Lipofectamine 3000 (Life Technologies), followed by puromycin selection (1 µg/mL) for 48 hr. Individual colonies were isolated after approximately 10 days, expanded and screened by PCR for the deletion of Yaf2 exons 1 and 2. Deletion of Yaf2 mRNA and protein was confirmed by qRT-PCR and Western Blot, using a YAF2-specific antibody (Park et al., 2015). Rybpfl/fl;Yaf2-/- cells were treated with 800 nM 4-hydroxytamoxifen (OHT) for 96 hr to conditionally delete RYBP, which was verified by Western Blot (Millipore AB3637). Chromatin immunoprecipitation was performed as described previously (Farcas et al., 2012), with minor modifications. For non-histone ChIP experiments, cells were fixed for 1 hr in 2 mM EGS, followed by 15 min in 1 % formaldehyde. Reactions were quenched by the addition of glycine to a final concentration of 125 µM. After cell lysis and chromatin extraction, chromatin was sonicated using a BioRuptor sonicator (Diagenode), followed by centrifugation at 16,000 × g for 20 min at 4°C. For histone ChIP experiments we used a native ChIP protocol combined with a calibrated ChIP-seq approach, as previously described (Bonhoure et al., 2014; Hu et al., 2015; Orlando et al., 2014). To achieve this, 1.25 × 107 Drosophila melanogaster S2 cells were spiked in to 5 × 107 Rybpfl/fl;Yaf2-/- mouse embryonic stem cells with or without OHT treatment. Nuclei were then isolated with RSB buffer (10 mM Tris-HCl (pH 8), 10 mM NaCl, 3 mM MgCl2) supplemented with 0.1 % NP-40 and 5 mM N-ethylmaleimide, followed by MNase digestion for 5 min with 150 U MNase (Fermentas, Waltham, MA) in 1 ml RSB supplemented with 0.25 M sucrose, 3 mM CaCl2 and 10 mM N-ethylmaleimide. Digestions were stopped with EDTA, before nuclei were pelleted by centrifugation at 1500 x g and the soluble S1 fraction collected. Pelleted nuclei were then resuspended in 300 µl nucleosome release buffer (10 mM Tris-HCl (pH 7.5), 10 mM NaCl, 0.2 mM EDTA, 10 mM N-ethylmaleimide), incubated at 4°C for 1 hr with gentle rotation, and then gently passed through a 27G syringe needle five times. Following centrifugation to pellet the insoluble material, the soluble S2 fraction was collected and combined with the S1 fraction. Immunoprecipitations were performed overnight at 4°C using chromatin corresponding to 5 × 106 cells. For non-histone ChIP experiments, chromatin was diluted in ChIP dilution buffer (1% Triton-X100, 1 mM EDTA, 20 mM Tris-HCl (pH 8), 150 mM NaCl), while for histone ChIPs, combined S1/S2 fractions were diluted in native ChIP incubation buffer (70 mM NaCl, 10 mM Tris (pH 7.5), 2 mM MgCl2, 2 mM EDTA, 0.1% Triton). Immunoprecipitations were carried out in a total volume of 1 ml using approximately 3 µg of antibody. Antibodies used for ChIP experiments were anti-H2AK119ub1 (Cell Signalling D27C4), anti-H3K27me3 (generated in-house), anti-RYBP (Millipore AB3637), anti-RING1B (Cell Signalling D22F2) and anti-SUZ12 (Cell Signalling D39F6). Antibody-bound chromatin was isolated on protein A agarose beads (RepliGen, Waltham, CA) or protein A magnetic Dynabeads (Invitrogen, Carlsbad, CA). For non-histone ChIPs, washes were performed with low salt buffer (0.1% SDS, 1% Triton, 2 mM EDTA, 20 mM Tris-HCl (pH 8.1), 150 mM NaCl), high salt buffer (0.1% SDS, 1% Triton, 2 mM EDTA, 20 mM Tris-HCl (pH 8.1), 500 mM NaCl), LiCl buffer (0.25 M LiCl, 1% NP40, 1% sodium deoxycholate, 1 mM EDTA, 10 mM Tris-HCl (pH 8.1)) and TE buffer (x2 washes) (10 mM Tris-HCl (pH 8.0), 1 mM EDTA). Native histone ChIPs were instead washed four times with native ChIP wash buffer (20 mM Tris-HCl (pH 7.5), 2 mM EDTA, 125 mM NaCl and 0.1% Triton), followed by a final TE buffer wash. To prepare ChIP-seq material, ChIP DNA was eluted, and cross-links reversed at 65°C in the presence of 200 mM NaCl where required. Samples were then treated with RNase and proteinase K before being purified with ChIP DNA Clean and Concentrator kit (Zymo, Irvine, CA). For calibrated ChIP-seq experiments, an input control was prepared for each individual sample, to allow the quantitation of spike-in consistency. ChIP-seq libraries were prepared using the NEBNext Ultra DNA Library Prep Kit, and sequenced as 40 bp paired-end reads on Illumina NextSeq500 platform. All ChIP-seq experiments were carried out in biological triplicate. To analyse the ChIP-seq experiments, reads were aligned to the mouse mm10 genome using bowtie2 (Langmead and Salzberg, 2012) with the '-no-mixed' and '-no-discordant' options, and non-uniquely mapping reads were discarded. ChIP-seq experiments which contained a spike-in genome (D. melanogaster) were aligned against a concatenated genome of the two genome sequences (mm10+dm6), and reads which mapped more than once were discarded. PCR duplicates were removed using SAMtools (Li et al., 2009). Spiking an identical concentration of D. melanogaster cells into our quantitative ChIP-seq experiments allows for calibration of each sample for IP efficiency and total mouse cell number. When comparing ChIP-seq for untreated and OHT-treated cell lines using an internal calibration, the number of mm10 reads were randomly downsampled to reflect the total number of dm6 reads in that sample. Furthermore, to adjust for variation in the dm6/mm10 ratio between biological replicates, each sample was adjusted using the percentage of dm6 reads relative to mm10 reads in each sample's input DNA. Biological replicates for ChIP-seq samples without internal spike-in were randomly downsampled to contain the same number of reads for each individual replicate. Genome coverage tracks were made using the pileup function of MACS2 (Zhang et al., 2008) and visualised using the UCSC genome browser. We identified regions of H2AK119ub1 enrichment using the dpeak function of DANPOS2 (-q 40 –kw 750 –kd 1500, height_logP > 100) (Chen et al., 2013) and peaks closer than 5 kilobases were merged. RING1B, SUZ12 and H3K27me3 peaksets were generated using MACS2 (-broad), and peaks closer than 2 kilobases were merged. Read counts within intervals were generated using custom script GFF.ReadCountFromList.pl. For non-calibrated ChIP-seq, reads per kilobase per million (RPKM) were calculated, while for calibrated ChIP-seq, normalised reads per kilobase (NRPK) were calculated (after normalisation to calibration genome). For each interval, biological triplicate NRPK or RPKM values were compared between untreated and OHT-treated samples using a two-sample T-Test, with a p value threshold of <0.05 being used to identify significant difference. Log2 fold change values were visualised using R (v 3.2.1), with scatterplots coloured by density using stat_density2d. Regression and correlation analyses were also performed in R using standard linear models and Pearson correlation respectively. Metaplots were made using HOMER (version 2) (Heinz et al., 2010), Heatmaps and genome-wide correlation analyses were generated using deepTools2. A ±10 kb window centred on H2AK119ub1 intervals was provided to deepTools2 for k-means clustering based on RYBP (this study) and CBX7 (Morey et al., 2013) ChIP-seq (Ryan et al., 2016). This generated two clusters, variant-enriched (RYBP-enriched but CBX7-depleted) and shared (RYBP- and CBX7-enriched). 1 × 107 Rybpfl/fl;Yaf2−/− cells with or without OHT were resuspended in 1 mL HS Lysis buffer (50 mM KCl, 10 mM MgSO4.7H20, 5 mM HEPES, 0.05% NP40 (IGEPAL CA630)), 1 mM PMSF, 3 mM DTT) for 1 min at room temperature to isolate nuclei. Nuclei were centrifuged at 1000 × g for 5 min at 4°C, followed by a total of three washes with ice-cold RSB buffer. Nuclei were then resuspended in 1 mL of TriZOL reagent (ThermoScientific) according to the manufacturer’s protocol. Nuclear RNA was treated with the TURBO DNA-free Kit (ThermoScientific) and depleted for rRNA using the RiboMinus kit and protocol (ThermoScientific). RNA-seq libraries were prepared using the NEBNext Ultra Directional RNA-seq kit (NEB) and libraries were sequenced on the Illumina NextSeq500 with 40 bp paired-end reads. RNA-seq reads were initially aligned against the rRNA genomic sequence (GenBank: BK000964.3) using bowtie2 to filter out rRNA fragments, prior to alignment against the mm10 genome using the STAR RNA-seq aligner (Dobin et al., 2013). To improve mapping of nascent, intronic sequences, reads which failed to map using STAR were aligned against the genome using bowtie2. Biological triplicate read counts were determined using a custom script (GFF_PairedEndRNA.ReadCount.pl) for a custom-built, non-redundant mm10 gene set. Briefly, mm10 refGene genes were filtered on size (>200 bp), gene body and TSS mappability, unique TSS and TTS, in order to remove poorly mappable and highly similar transcripts. The final set of 20,633 genes were used for differential analysis using DESeq2 (Love et al., 2014), with default settings and a significance threshold of padj < 0.05. Previously published nuclear RNA-seq from RING1Bfl/fl;RING1A-/- was aligned and processed in an identical manner (Schoenfelder et al., 2015). Statistical significance between Polycomb target TSS and non-Polycomb TSS was assessed using Wilcoxon signed rank test. Venn diagram overlap of significantly increased genes was performed using BioVenn (Hulsen et al., 2008). ChIP-seq and RNA-seq data from the present study are available for download at GSE83135. Previously published datasets used for analysis include wildtype embryonic stem cell (E14) H3K4me3 from the ENCODE project (GSE31039), CBX7 ChIP-seq (GSE42466; Morey et al., 2013), RNA polymerase II ChIP-seq (GSE34520; Brookes et al., 2012), MNase-seq (GSE59064; Anderson and Slotkin, 1975); RING1A-/-;RING1Bfl/fl nuclear RNA-seq (E-MTAB-3125; Schoenfelder et al., 2015) and RING1BI53A mutant (GSE69978; Illingworth et al., 2015). Molecular and Cellular Biology 26:2560–2569. Trends in Biochemical Sciences 37:49–57. Nature Reviews Molecular Cell Biology 16:643–649. Molecular and Cellular Biology 36:900–912. Molecular and Cellular Biology 26:6880–6889. The Journal of Biological Chemistry 250:7182–7187. Molecular and Cellular Biology 32:1139–1149. Nature Structural & Molecular Biology 21:569–571. Nature Structural & Molecular Biology 23:682–690. The Journal of Cell Biology 178:219–229. Molecular and Cellular Biology 22:6070–6078. Journal of Biological Chemistry 281:20643–20649. Current Opinion in Genetics & Development 19:150–158. Biochimica Et Biophysica Acta (BBA) - Molecular Cell Research 1853:1060–1072. Molecular and Cellular Biology 25:7193–7202. Nucleic Acids Research, 44, 10.1093/nar/gkw257. Molecular and Cellular Biology 17:4105–4113. The controversial role of the Polycomb group proteins in transcription and cancer: how much do we not understand Polycomb proteins? Thank you for submitting your article "RYBP stimulates PRC1 to shape chromatin-based communication between Polycomb repressive complexes" for consideration by eLife. Your article has been reviewed by three peer reviewers, one of whom is a member of our Board of Reviewing Editors and the evaluation has been overseen by Jessica Tyler as the Senior Editor. The following individual involved in review of your submission has agreed to reveal her identity: Wendy A Bickmore (Reviewer #3). 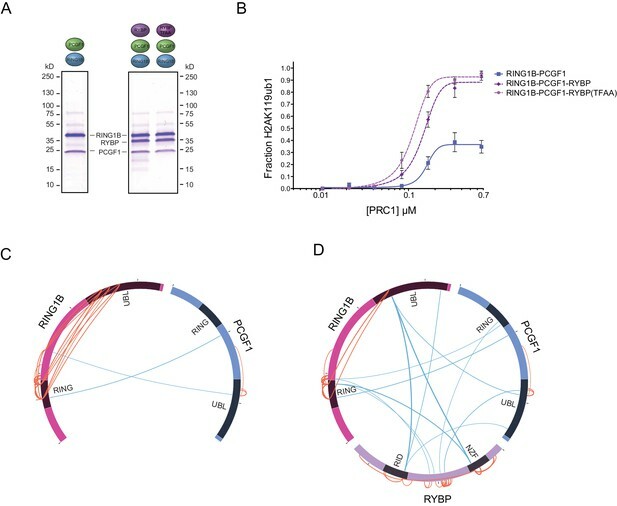 In this manuscript, Rose and colleagues use biochemical and genetic approaches to address how the RYBP subunit of non-canonical PRC1 (ncPRC1) complexes contribute to transcriptional regulation and if they also contribute to PRC2 complex activity. This is in the context of recent studies reporting that the ubiquitination of H2A (mediated by ncPRC1 complexes) is both capable of recruiting the PRC2 complex to an artificial gene locus (Blackledge et al., 2014, Cell; Cooper et al., 2014) and increasing the activity of PRC2 in vitro (Kalb et al., 2014, Nature Structural Molecular Biology). However, more recent genetic evidence in Ring1a/b double knockout cells have shown that a complete ablation of ncPRC1 activity did not affect global H3K27me3 levels in gut tissues (Chiacchiera et al., Cell Stem Cell, 2016). Furthermore, while the loss of PRC2 mediated H3K27me3 leads to HOX gene derepression in Drosophila (Pengelly et al., Science, 2013), the complete loss of H2A ubiquitination did not phenocopy this (Pengelly et al., Genes & Development 2015). Likewise, recent genetic studies questioned the importance of H2A ubiquitination for Polycomb silencing in mice (Illingworth et al., Genes Dev. 2015). Despite this, we know from these studies and others, that ncPRC1 and indeed H2Aub are essential for embryonic development. Finally, that RYBP can stimulate H2Aub1 by a subset of PRC1 complexes is already established in ES cells and in flies (Gao et al., 2012; Fereres et al., 2014, PLoS One). Moreover, cross-talk between PRC1/H2Aub1 and PRC2/H3K27me3 has been examined previously (Tavares et al., 2012; Blackledge et al., 2014; Cooper et al., 2014; Kalb et al., 2014; Illingworth et al., Genes Dev. 2015; Pengelly et al., Genes Dev 2015; Fereres et al., 2014, PLoS One; Morey et al., Cell Reports 3, 2013), but these studies resulted in rather diverse conclusions. In this overall well-done study, the authors firstly establish an in vitro ubiquitination assay for ncPRC1, and use it to explore the role of the RYBP subunit (Figures 1–4). They discover that RYBP is capable of considerably boosting H2A ubiquitination in vitro. In Figures 5–9, they use knockout mouse embryonic stem (ES) cells to explore the roles of RYBP in vivo. They compare a Yaf2 knockout ES cells and Rybp/Yaf2 double knockout ES cells to examine the effect on the global levels of H2AK119ub1 (Western blot) and at selected Polycomb target genes (ChIP-seq). While surprisingly, they observe that the overall global levels of H2AK119ub1 are apparently unchanged in the RYBP/Yaf2 double knockout ES cells, they detect moderate local reductions of H2AK119ub1 at sites normally occupied by Rybp and Ring1b. Taken together with their in vitro observations, these results suggest that Rybp and Yaf2 are not essential for the H2AK119ub1 activity of ncPRC1 complexes and rather are co-factors that can augment activity, perhaps at more weakly bound sites. They then go on to correlate local reductions in H2AK119ub1 with moderate reductions in H3K27me3 and slight increases in transcription at some of the affected Polycomb target genes. 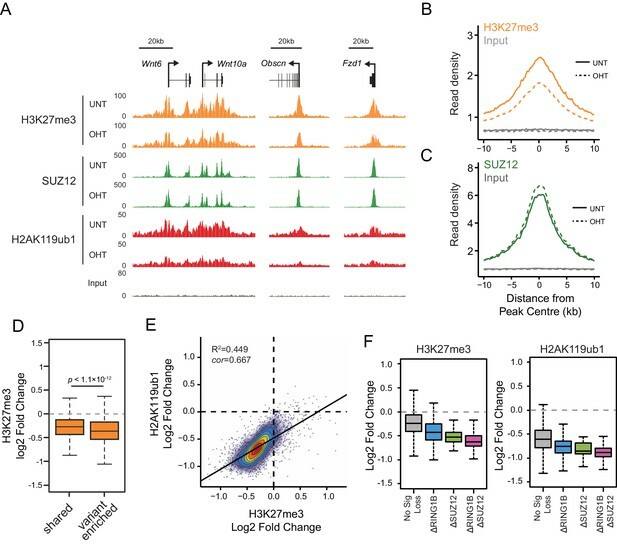 However, they report that this reduced H3K27me3 does not correlate with reduced PRC2 complex occupancy, as measured by ChIP-seq analysis of Suz12 in their Rybp/Yaf2 double knockout ES cells. The authors use these observations to propose a model for the communication between PRC1 and PRC2, at least on a number of gene regulatory loci. Whereas the reviewers found the manuscript potentially interesting for the readership of eLife, because it shed light on the function of RYBP and the communication between PRC1 and PRC2, several major concerns were raised that will need to be addressed experimentally. 1) The authors should avoid making quantitative conclusions about Ring1b (Figure 6) and Suz12 (Figure 8) in the wild-type versus Rybp/Yaf2 double knockout ES cells. They rightly point out that the ChIP-RX method (Orlando et al., Cell Reports, 2014,) is the correct approach to quantify potential changes in the H2AK119ub1 and H3K27me3 histone marks. However, they employ non-quantitative ChIP-seq to look at the Ring1b and Suz12 binding profiles. They should instead employ a careful, quantitative ChIP-qPCR approach, checking multiple representative sites, in order to properly evaluate if Ring1B and Suz12 occupancy change in the Rybp/Yaf2 double knockout ES cells (Figure 6 and 8). This is especially important for both their model that RYBP primarily influences ncPRC1 activity (and not level, or localization of the complex, as published by others see e.g. Gao et al., 2012; Tavares et al., 2012; Morey et al., Cell Reports 3, 2013) and the open question whether the presence of H2AK119ub1 might either lead to increased recruitment of PRC2 or increase its activity (again, the authors should content with the already published work). Based on ChIP data the authors conclude that H2A ubiquitination is required for normal H3K27 methylation and proposed an "activity-based communication between PRC1 and PRC2". While this conclusion is likely to be correct (this point has basically been made in earlier publications), this cannot be concluded solely from ChIP data in this manuscript. In fact, Kalb et al. (2014) already did an experiment that allows such a mechanistic interpretation by showing that nucleosomes containing H2Aub1 are a better substrate for H3K27 methylation by PRC2. 2) The authors should carry out gene ontology (GO) analysis of the genes that lose both H2AK119ub1 and H3K27me3 at their promoters in the Rybp/Yaf2 double knockout ES cells in a bid to identify ncPRC1 specific sets of target genes and compare to similar work in previous studies. It would be interesting to further delineate those H3K27me3 positive genes that do and don't have reduced H3K27me3 in the Rybp/Yaf2 double knockout ES cells. This would be important for the readers in light of previous work delineating the biological roles of cPRC1 and ncPRC1 (Pengelley et al., 2015 and Illingworth et al., 2015). These studies found that H2A ubiquitination appears to be dispensable for Polycomb dependent repression of the Hox genes. However, since H2Aub is required for both fly and mouse viability, it becomes interesting to begin to determine which genes are dependent on ncPRC1 mediated H2AK119ub1 for their regulation. 3) To better report the genome-wide binding profiles of cPRC1 and ncPRC1 in ES cells, the authors should include heat maps of their ChIP-seq data for all transcription start sites (+/- 5kb) for Cbx7 (Morey et al., 2013, Cell Reports), Ring1b (+/-OHT), Rybp (+/-OHT), H2AK119ub1 (+/-OHT) and H3K27me3 (+/-OHT). This would help delineate the cPRC1 and ncPRC1 unique target genes and it may shed light on whether loss of Rybp affects H3K27me3 levels at shared ncPRC1 and cPRC1 target genes or on ncPRC1 specific target genes only. 4) Following this heat map analysis, the authors should investigate whether the 230 Polycomb target genes that have an increase in transcription in their Rybp/Yaf2 double knockout cells (Figure 9) are ncPRC1 specific, cPRC1 specific or ncPRC1 and cPRC1 shared target genes. They should provide ChIP-qPCRs of Suz12, H3K27me3 and Ring1b at a representative set of these gene promoters. 5) In Figures 1–4 reconstituted histone H2A ubiquitination assays are used in which different recombinant PRC1 assemblages are compared by titrating increasing amounts of enzyme with a fixed substrate and the% conversion at the end of the reaction is determined. The correct way to compare enzymatic activities is to determine reaction rates. I.e. measure conversion over time using a fixed amount of enzyme and substrate! This experiment should be included for a few key complexes. Another critical issue is that the ratio enzyme vs substrate (nucleosomes) is not clear. It is essential that the substrate is in excess over the enzyme (this should be shown). Finally, a better analysis of the nucleosomes used in the assays need to be provided. E.g. are there free histones in the prep? An additional nucleosome purification step (e.g. glycerol centrifugation or size exclusion chromatography) would give more confidence. This is also important because the results in this manuscript are at odds with published work from other groups (e.g. Gao et al. 2012; Tavares et al., 2012). Finally, subsection “PCGF1-PRC1 is a highly modular protein complex” – and Figure 1D. It appears that the absence of RYBP leads to consistently reduced levels of PCGF1 (lanes 4 to 6) and possibly a slight reduction in BCOR (lane 5). This suggests that RYBP may help to stabilize these interactions. Quantitation of this blot should be performed and these result discussed in the text. 6) The Introduction, and actually most of the manuscript, does not give a clear overview of what has already been published on this topic. It is not that many major references were missing (although e.g. the work of the Sixma lab (Buchwald et al., 2006) should be included), rather the Introduction does not clearly summarized the work already done. In addition, somewhat more attention to work in the fly would be helpful to the reader as well. E.g. ncPRC1 complexes and there role in histone ubiquitylation were first described in the fly (Lagarou et al., 2008). Finally, in the Results and DDiscussion sections, findings by others with similar experiments should be mentioned and where appropriated differences should be discussed. The whole manuscript strongly emphasizes the catalytic functions of PRC1/2 but this needs to be much better balanced by a discussion of the substantial evidence – both in vitro and in vivo, and in flies and mammals – that PRC1 executes many of its functions through a structural change in the underlying chromatin and that is independent of its catalytic activity. 1) The authors should avoid making quantitative conclusions about Ring1b (Figure 6) and Suz12 (Figure 8) in the wild-type versus Rybp/Yaf2 double knockout ES cells. They rightly point out that the ChIP-RX method (Orlando et al., Cell Reports, 2014,) is the correct approach to quantify potential changes in the H2AK119ub1 and H3K27me3 histone marks. However, they employ non-quantitative ChIP-seq to look at the Ring1b and Suz12 binding profiles. They should instead employ a careful, quantitative ChIP-qPCR approach, checking multiple representative sites, in order to properly evaluate if Ring1B and Suz12 occupancy change in the Rybp/Yaf2 double knockout ES cells (Figure 6 and 8). This is especially important for both their model that RYBP primarily influences ncPRC1 activity (and not level, or localization of the complex, as published by others see e.g. Gao et al., 2012; Tavares et al., 2012; Morey et al., Cell Reports 3, 2013) and the open question whether the presence of H2AK119ub1 might either lead to increased recruitment of PRC2 or increase its activity (again, the authors should content with the already published work). We agree with the reviewer(s) that this is an important point and we have now performed new ChIP-qPCR analysis for RING1B, SUZ12, H2AK119ub1, and H3K27me3 in biological triplicate at multiple representative sites. This analysis has confirmed that RING1B and SUZ12 are largely retained, or even in some instances elevated in the case of SUZ12 (consistent with our ChIP-seq meta-analysis for SUZ12 – see Figure 8C), while H2AK119ub1 and H3K27me3 are reduced following removal of RYBP/YAF2 as suggested by our original ChIP-seq analysis. These new ChIP-qPCR results have been integrated as new supplementary figures (Figure 6—figure supplement 1 and Figure 8—figure supplement 2), and further support the argument that RYBP/YAF2 acts to influence PRC1 and PRC2 activity rather than their binding to chromatin. Based on ChIP data the authors conclude that H2A ubiquitination is required for normal H3K27 methylation and proposed an "activity-based communication between PRC1 and PRC2". While this conclusion is likely to be correct (this point has basically been made in earlier publications), this cannot be concluded solely from ChIP data in this manuscript. In fact, Kalb et al. (2014) already did an experiment that allows such a mechanistic interpretation by showing that nucleosomes containing H2Aub1 are a better substrate for H3K27 methylation by PRC2. We agree this is an interesting and important question and thank the reviewer(s) for the suggestion. To examine these relationships in more detail we undertook two complementary new analyses. Firstly, as suggested by the reviewer(s), we identified polycomb targets which relied the most (RYBP-dependent) or the least (RYBP-independent) on RYBP for H3K27me3, and compared their gene ontology (GO) enrichment terms (Author response image 1). Both groups of polycomb targets were enriched for GO terms implicated in development (e.g. “system development”, “developmental process”, “organ development” (Author response image 1A and B)), consistent with polycomb complexes playing an important role in regulating developmental genes in embryonic stem cells. However, interestingly, sites which retained the most H3K27me3 in the absence of RYBP/YAF2 exhibited enrichment for DNA binding and sequence-specific transcription factors (Autho response image 1A and B). These transcription factors are often master regulators involved in developmental decision making processes, and are found in large and very CpG dense islands that have high levels of polycomb protein occupancy, H3K27me3, and H2AK119ub1 ((Long et al., 2013) and Author response image 1C). In this context the stimulatory activity of RYBP and H2AK119ub1 appears less pronounced, suggesting that these sites may have sufficient PRC2 occupancy to render RYBP and H2AK119ub1-dependent stimulation less relevant. 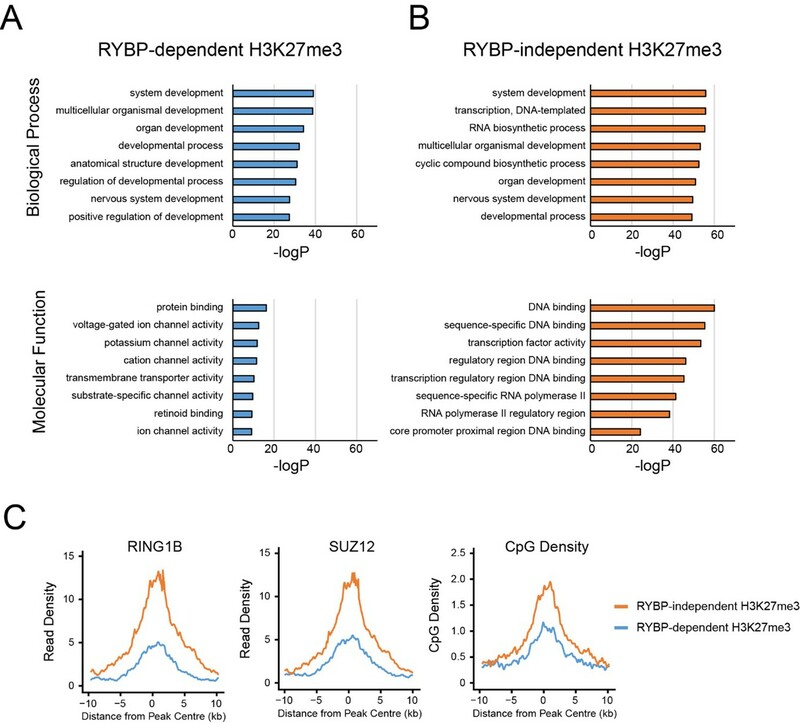 GO analysis of RYBP-dependent and –independent H3K27me3 genes. (A,B) PRC1 target genes with the largest reductions in H3K27me3 (RYBP-dependent H3K27me3; Top 25%), or the PRC1 targets with the smallest reductions in H3K27me3 (RYBP-independent) were used for gene ontology analysis using HOMER. (C) Metaplot analysis at PRC1 target sites with RYBP-dependent or RYBP-independent H3K27me3. This reveals that RYBP-independent H3K27me3 is associated with the largest polycomb domains, as measured by RING1B, SUZ12 and CpG density. Secondly, to further investigate the relationship between canonical PRC1 (cPRC1) and variant (vPRC1), we performed de novo clustering based on enrichment of RYBP (this study) and CBX7 (Morey et al., 2013) at H2AK119ub1 sites and arrived at a shared and variant-enriched set of PcG target sites (see essential reviewer point 3 for more details). In agreement with the segregation of sites based on changes in H3K27me3, both groups were strongly associated with developmental processes; however the shared sites exhibited a slight preference for sequence-specific transcription factors. Variant enriched sites also encompassed transcription factors, but in general represented a set of genes that included a more broad range of biological processes. Together this suggests that sequence-specific transcription factors may have evolved to use a more robust complement of cPRC1 and vPRC1 activities to help maintain H2AK119ub1 while vPRC1 may play a broader role in shaping H2AK119ub1 associated with a range of biological processes. We have integrated these analyses into the revised manuscript, with GO term analysis included in Figure 7—figure supplement 1. We have also discussed these findings where relevant (see subsection “RYBP-dependent stimulation is essential for H2AK119ub1 at sites with low PRC1 occupancy”). We thank for the reviewer(s) for this useful suggestion, and agree that the manuscript would benefit from a better understanding of the relative contribution of RYBP towards previously proposed canonical and/or variant PRC1 targets (as also covered in essential reviewer point 2). To address this important point, we implemented the reviewer(s) suggestion and profiled H2AK119ub1, RING1B, RYBP, and SUZ12 in the presence and absence of RYBP/YAF2 at TSS ± 5kb clustered based on the presence of RING1B and the relative levels of RYBP (vPRC1) and CBX7 (cPRC1). This revealed a set of “shared” sites, with high levels of vPRC1 and cPRC1, and “variant-enriched” sites, which exhibited lower levels of CBX7 (Author response image 2A). In contrast to previous work (Morey et al., 2013) we failed to identify cPRC1 (CBX7)-enriched sites that lack vPRC1 (RYBP). Initially this was puzzling to us, but a closer inspection of the genes that were previously reported to lack RYBP yet have CBX7 binding ((Morey et al., 2013) Figure 2C) revealed a clear enrichment for RYBP in our experiments and this signal was lost in response to tamoxifen-induced removal of RBYP (Author response image 3). The differences in RYBP ChIP enrichment between our studies is presumably the result of differing ChIP protocols (e.g. formaldehyde only crosslinking (Morey et al) versus formaldehyde/EGS crosslinking (our study)). Nevertheless, it is clear that CBX7 occupied sites fall into the shared category that are also occupied by RYBP. In the revised manuscript, we now highlight this important point (subsection “RYBP-dependent stimulation is essential for H2AK119ub1 at sites with low PRC1 occupancy”). Intriguingly, we observed that both shared and variant-enriched PcG TSS appeared to be similarly affected in their reductions of H2AK119ub1 and H3K27me3 (Author response image 2A), and we did not observe any obvious changes in RING1B or SUZ12 occupancy at either group. However, a visual examination of polycomb domains and their associated genes indicated that the use of a simple fixed window surrounding the TSS would not likely capture the behaviour of the entire domain, particularly when considering H2AK119ub1 and H3K27me3 which are often broad in nature (Author response image 2B). Therefore, we instead opted to use a clustering and heat mapping approach focused on H2AK119ub1 intervals. This revealed that although all polycomb target sites experience reductions in H2AK119ub1 and H3K27me3, variant-enriched sites showed a slightly larger reduction in both of these modifications (Figure 7F and G, Figure 8D). We have now incorporated these analyses and interpretations into the revised Figures and manuscript highlighting the preferential contribution of RYBP towards vPRC1-enriched sites and described these observations on in the revised manuscript. TSS clustering and heatmap analysis of variant and canonical PRC1. (A) Non-redundant mm10 refGene TSSs (n=20634) were clustered into Polycomb (PcG) or non-PcG TSS. These were then further clustered based on RYBP and CBX7 binding (Morey et al., 2013) into shared (RYBP and CBX7 aka variant and canonical PRC1) and variant-enriched (RYBP-enriched) TSSs. Non-PcG TSSs were clustered by H3K4me3 to identify in active and inactive TSS. (B) Genomic snapshot of Six1 and Shh TSSs. A fixed window of ± 5kb is depicted from the TSS (arrow). This simple windowing suffers from the fact that it does not capture the true polycomb chromatin domain. In contrast intervals based on H2AK119ub1 more accurately represent the region corresponding to the polycomb chromatin domain. Analysis of RYBP occupancy at previously described canonical PRC1-specific sites. Genomic snapshots of ChIP-seq signal for RYBP (datasets from this study and (Morey et al., 2013)), CBX7 (Morey et al., 2013), RING1B (this study) and SUZ12 (this study) at three genes previously reported as being occupied by cPRC1 and RYBP-free/depleted (Morey et al., 2013). Our RYBP ChIP-seq data (complete with RYBP knockout control (OHT)), clearly shows enrichment for RYBP at these genes. Importantly, RYBP enrichment at these sites is comparable in magnitude to other ncPRC1-enriched and shared sites (for example compare with Figure 7E). 4) Following this heat map analysis, the authors should investigate whether the 230 Polycomb target genes that have an increase in transcription in their Rybp/Yaf2 double knockout cells (Figure 9) are ncPRC1 specific, cPRC1 specific or ncPRC1 and cPRC1 shared target genes. To address this question, we segregated polycomb-occupied TSS into shared and variant-enriched PRC1 targets and examined which of these two sets the reactivated genes fell into. This analysis showed that upregulated genes fell roughly into both categories. We have now indicated this in the text of the revised manuscript in subsection “Loss of RYBP culminates in gene reactivation at sites where Polycomb chromatin domains are compromised” and Figure 9—figure supplement 2. They should provide ChIP-qPCRs of Suz12, H3K27me3 and Ring1b at a representative set of these gene promoters. As requested, we have performed new ChIP-qPCRs for RING1B, SUZ12, H3K27me3 and H2AK119ub1 in biological triplicate at a set of representative genes that are up-regulated upon loss of RYBP/YAF2. The results of these analyses further support the contention (Figure 9) that up-regulated genes tended to have compromised polycomb domains, as evidenced by reductions in RING1B and SUZ12 binding (Figure 9—figure supplement 3). 5) In Figures 1–4 reconstituted histone H2A ubiquitination assays are used in which different recombinant PRC1 assemblages are compared by titrating increasing amounts of enzyme with a fixed substrate and the% conversion at the end of the reaction is determined. The correct way to compare enzymatic activities is to determine reaction rates. I.e. measure conversion over time using a fixed amount of enzyme and substrate! This experiment should be included for a few key complexes. The reviewer is correct in noting this experimental setup does not conform to Michaelis-Menten analysis of reaction rates. This was a deliberate decision that we made in designing these experiments and we will explain why in more detail here. Currently, the only method we have found to easily measure PRC1 activity in vitro is to follow the conversion of H2A to ubiquitylated H2A by western blot. As indicated by the reviewer, to set up an experiment to measure classical Michaelis-Menten kinetics, one must (a) have substrate in large excess over enzyme, and (b) vary substrate amount relative to fixed enzyme concentration. In the available experimental set-up, western blot analysis has not proven sensitive enough to robustly detect conversion of H2A to uH2A at low substrate concentrations, effectively excluding Michaelis-Menten analysis. Furthermore, the analysis of Michaelis-Menten kinetics in the multi-reaction ubiquitylation cascade (E1, E2, and E3) necessary to achieve uH2A would be extremely challenging to design and to interpret correctly. To our knowledge this has not previously been achieved for histone ubiquitylation reaction cascades. Therefore we chose to employ a dose-response approach in order to measure and compare the relative E3 ubiquitin ligase activity of different PRC1 complex assemblies by following percentage conversion of a fixed amount of substrate. In fact, similar approaches have previously been used to compare the relative activities of PRC1 complexes (Gao et al., 2012, Tavares et al., 2012, Buchwald et al., 2006, Cao et al., 2005, Li et al., 2006), enabling us to broadly compare our new findings with previous work in this area. Nevertheless, to avoid any confusion we have now clarified this point in the text of manuscript and explicitly indicate that we are comparing relative activities as opposed to reaction rates in the Results section. Another critical issue is that the ratio enzyme vs substrate (nucleosomes) is not clear. It is essential that the substrate is in excess over the enzyme (this should be shown). As noted above, this point is particularly relevant in situations where Michaelis-Menten-type kinetic analyses are being conducted, which we have not attempted to do here. However, we realise that in the initial submission the concentration of nucleosome in ubiquitylation reactions was inadvertently omitted. We have now added this information to the Materials and methods in the revised manuscript. Finally, a better analysis of the nucleosomes used in the assays need to be provided. E.g. are there free histones in the prep? An additional nucleosome purification step (e.g. glycerol centrifugation or size exclusion chromatography) would give more confidence. This is also important because the results in this manuscript are at odds with published work from other groups (e.g. Gao et al. 2012; Tavares et al., 2012). Octamers were purified by gel filtration and displayed the expected equimolar ratio of histones. In the nucleosome reconstitutions, DNA was always in slight excess over octamer, and tris-borate native agarose gels used to examine the reconstituted nucleosomes indicated that only a small proportion of unincorporated DNA was present relative to nucleosomal DNA. This suggests a near complete incorporation of octamers into nucleosomes under our reconstitution conditions as we have previously published (Zhou et al., 2012). Furthermore, it has been demonstrated that PRC1 is highly specific towards H2A in the context of nucleosomes, and any non-specific activity on free histone results in polyubiquitylation (Elderkin et al., 2007), which would not be detected in our western blotting measurements of H2AK119ub1. Finally we do not believe that the results of our in vitro assays are at odds with either of the studies mentioned by the reviewer. In Gao et al., it was also demonstrated that RYBP stimulates the activity of a PCGF4-containing complex (see (Gao et al., 2012) Figure 5F), which is in agreement with our observations in Figure 3B. In Tavares et al., the influence of RYBP on catalytic activity of PRC1 was tested using a PCGF2-containing complex, which we did not directly examine in our study. Finally, subsection “PCGF1-PRC1 is a highly modular protein complex” and Figure 1D. It appears that the absence of RYBP leads to consistently reduced levels of PCGF1 (lanes 4 to 6) and possibly a slight reduction in BCOR (lane 5). This suggests that RYBP may help to stabilize these interactions. Quantitation of this blot should be performed and these result discussed in the text. We have now quantified PCGF1 in the indicated complex preparations and find the levels are reduced in the absence of RYBP as suggested by the reviewer. We thank the reviewer for pointing this out as we believe it further supports the observations from crosslinking mass spectrometry analysis (Figure 4C and D) that RYBP inclusion in the complex may lead to structural alterations that limit the self-association of RING1B, possibly helping to support a stable and enzymatically competent PRC1 complex. We have now included the quantification of these results in Figure 4—figure supplement 1 and described this interesting observation in the text (subsection “RYBP-dependent stimulation of PCGF1-PRC1 is associated with changes in the PCGF1-RING1B dimer but not with ubiquitin binding”). Importantly, however, the reduced level of PCGF1 does not explain activity differences between complexes, as complexes that contain RYBP simulate the relative activity of PRC1 to a much larger extent than can be explained by elevated PCGF1 levels (Figure 2B and C) and both RYBP and YAF2 also significantly stimulate the activity of pre-existing RING1B/PCGF1 assemblies (Figure 2—figure supplement 1B). Further structural work in the future will be imperative to understand the nature of this RYBP dependent stimulation. 6) The Introduction, and actually most of the manuscript, does not give a clear overview of what has already been published on this topic. It is not that many major references were missing (although e.g. the work of the Sixma lab (Buchwald et al., 2006) should be included), rather the Introduction does not clearly summarized the work already done. In addition, somewhat more attention to work in the fly would be helpful to the reader as well. E.g. ncPRC1 complexes and there role in histone ubiquitylation were first described in the fly (Lagarou et al., 2008). We have now made extensive updates to the Introduction to cover in more detail the work already published in this area and we have specifically included observations from fly studies which we agree are important. Elsewhere in the manuscript, we have better summarized the published literature where appropriate. Finally, in the Results and Discussion sections, findings by others with similar experiments should be mentioned and where appropriated differences should be discussed. The whole manuscript strongly emphasizes the catalytic functions of PRC1/2 but this needs to be much better balanced by a discussion of the substantial evidence – both in vitro and in vivo, and in flies and mammals – that PRC1 executes many of its functions through a structural change in the underlying chromatin and that is independent of its catalytic activity. The reviewer(s) are correct that we have emphasized the catalytic activity of PRC1 and PRC2 as our study was focused on understanding the factors responsible for PRC1 catalytic activity in vitro (Figures 1 – 4) and how this relates to the acquisition of histone modifications in vivo. Unfortunately, from our current study we can infer very little about non-catalytic functions of PRC1, with the exception that gene expression changes appear to be more closely linked to reductions in the occupancy of PRC1/PRC2, not simply reductions H2AK119ub1/H3K27me3. We have now extensively altered the text and Discussion to indicate that PRC1 likely executes many of its functions through structural changes in the underlying chromatin structure independent of its catalytic activity. Work in the Klose lab is supported by the Wellcome Trust, the Lister Institute of Preventive Medicine, and Exeter College University of Oxford, EMBO, and the European Research Council. NRR acknowledges a Junior Research Fellowship from St John’s College, University of Oxford. BMK was supported by the John Fell Fund 133/075 and the Wellcome Trust grant 097813/Z/11/Z, and RF by a Kennedy Trust Fund awarded to BMK. We would like to thank Haruhiko Koseki and Miguel Vidal for the kind gift of Rybpfl/fl mouse embryonic stem cells, in addition to Imre Berger for supplying us with the multiBAC expression system and HoGeun Yoon for the YAF2-specific antibody. We would also like to acknowledge Tom Owen-Hughes and the late Jonathan Widom for providing us with the pGEM-3Z 601 plasmid, and Huseyin Besir and Ines Racke at the Protein Expression and Purification Core Facility, EMBL for Baculovirus expression. We thank Rebecca Konietzny and Philip Charles for help with mass spectrometry analysis and data processing, and Tom Milne and Emilia Dimitrova for critical reading of the manuscript. © 2016, Rose et al.